A key factor in the long-term performance of both asphalt and portland cement concrete pavements is initial pavement smoothness. In general, the smoother a pavement is built, the smoother it stays over time, resulting in lower maintenance costs and more comfort and safety for the traveling public. State highway agencies recognized in the 1960s the importance of controlling initial pavement smoothness, and began developing and implementing smoothness specifications. As the technology and equipment for measuring pavement smoothness advanced, two predominant methods emerged. The profilograph is widely used to measure and control initial smoothness by producing profile traces, which can be evaluated to identify severe bumps and to establish an easily understood, overall measure of smoothness, the profile index (PI). However, concerns about the accuracy of the profilograph have grown significantly in the last decade. The more recently developed inertial profiler is used to quickly and accurately monitor in-service pavements, and produces a more definitive profile of a pavement from which the widely accepted International Roughness Index (IRI) can be computed. Use of inertial profilers has remained limited in initial construction acceptance testing due to their higher cost and constraints on timeliness of testing. Thus, in many agencies, initial pavement smoothness has been measured one way (profilograph PI) and smoothness over time has been measured another way (inertial profiler IRI). Despite efforts to make adjustments for more accuracy in the computation of PI, it is evident that IRI will become the statistic of choice in future smoothness specifications. So how do agencies make the switch from their current PI-based specifications to IRI specifications? This study attempts to provide answers through the analysis of comprehensive time history smoothness data collected by high-speed inertial profilers under the Long-Term Pavement Performance (LTPP) program. Using advanced computer simulation algorithms, it is possible to compute PI values from surface profile data, thereby allowing detailed comparisons between IRI and PI. This document is disseminated under the sponsorship of the Department of Transportation in the interest of information exchange. The U.S. Government assumes no liability for its contents or use thereof. This report does not constitute a standard, specification, or regulation. ERES Division of Applied Research Associates, Inc., 505 W. University Avenue, Champaign, IL 61820. Nearly all State highway agencies use smoothness specifications to ensure that hot-mix asphalt (HMA) and Portland cement concrete (PCC) pavements are built to high levels of smoothness. Not only is an initially smooth pavement generally indicative of quality workmanship, but it has been shown to last longer than a pavement built rougher. About half of all current State smoothness specifications for HMA and more than three-fourths of all current PCC smoothness specifications are centered around the Profile Index (PI), as often measured using a profilograph. The vast majority of these specifications utilize a 5-mm (0.2-inch) blanking band in computing PI (i.e., PI5-mm). Unfortunately, because of the technical limitations of the profilograph equipment and PI computation procedures, the adequacy of PI5-mm in characterizing roughness and having it relate to user response has come into question. 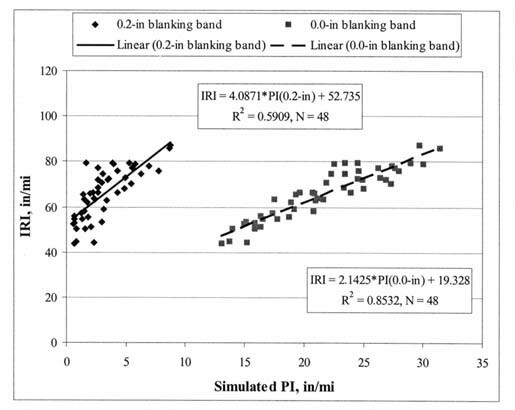 The International Roughness Index (IRI) or the Profile Index using a 0.0-mm blanking band (PI0.0) seem to provide better measures of smoothness and better correlation with user response. However, one barrier to more widespread implementation of these new smoothness standards is the lack of objective, verifiable correlation methods for use in establishing specification limits using the IRI or PI0.0. Assistance in selecting appropriate IRI and PI0.0 specification limits is needed to provide a basis for modifying current specifications to these more reproducible and portable smoothness indices. This research effort has developed a series of relationships between IRI and PI that can assist States in transitioning to an IRI or PI0.0 smoothness specification for HMA and PCC pavements. LTPP, pavement smoothness, profilograph, inertial profiler, international roughness index, profile index, smoothness limits. 1. Sensitivity of simulated profilograph to spatial frequency. 2. Relationship between IRI and manually generated PI in PTI profilograph calibration study. 3. Relationship between IRI and computer-generated PI in PTI profilograph calibration study. 4. 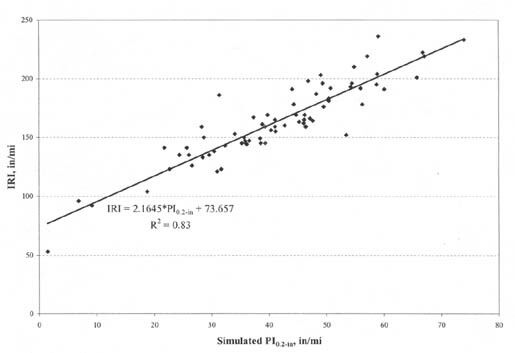 Correlation of IRI and PI in Arizona pavement smoothness study. 5. IRI-PI5-mm (PI0.2-inch) correlations established in Florida's ride quality equipment study. 6. IRI-PI2.5-mm (PI0.1-inch) and IRI-PI0.0 correlations established in Florida's ride quality equipment study. 7. Relationship between IRI and computer-simulated PI values in TTI equipment comparison study. 8. Plots of IRI and simulated PI0.0 values generated by various profilers in Kansas DOT lightweight profiler comparison study. 9. Relationship between IRI and California profilograph PI0.0 in Kansas DOT lightweight profiler comparison study. 10. Relationship between IRI and simulated PI0.2-inch (PI5-mm) in Illinois DOT bridge smoothness study. 11. Graphical comparison of documented PI5-mm-IRI smoothness relationships. 12. Graphical comparison of documented PI2.5-mm-IRI smoothness relationships. 13. Graphical comparison of documented PI0.0-IRI smoothness relationships. 14. Flow chart for developing pavement smoothness models. 15. Histogram showing the distribution of IRI data used in model development (all AC pavements). 16. Histogram showing the distribution of IRI data used in model development (all PCC pavements). 17. Histogram showing the distribution of PI5-mm data used in model development (all AC pavements). 18. Histogram showing the distribution of PI5-mm data used in model development (all PCC pavements). 19. IRI vs. PI0.0 for all AC pavements and climates. 20. PI0.0 vs. PI5-mm for all PCC pavements and climates. 21. IRI vs. PI0.0 by AC pavement type for all climates. 22. PI0.0 vs. PI5-mm by climate for all PCC pavement types. 23. 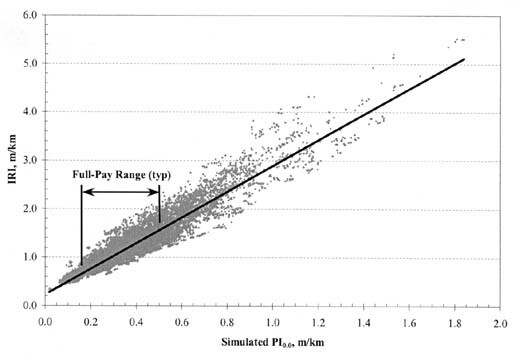 Graphical comparison of PI5-mm-IRI smoothness relationships for AC pavements. 24. 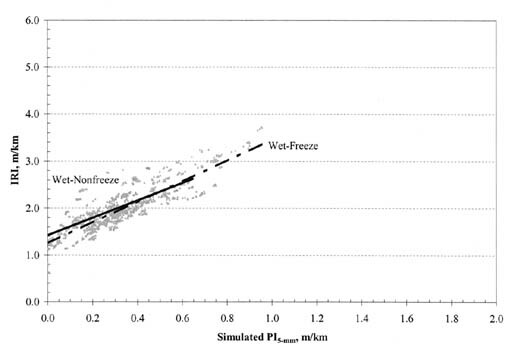 Graphical comparison of PI5-mm-IRI smoothness relationships for PCC pavements. 25. 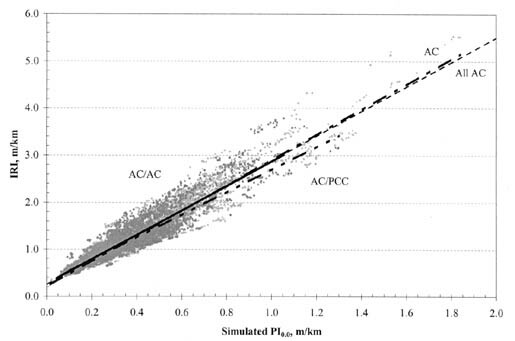 Graphical comparison of PI2.5-mm-IRI smoothness relationships for AC pavements. 26. Graphical comparison of PI0.0-IRI smoothness relationships for AC pavements. 27. Graphical comparison of PI0.0-IRI smoothness relationships for PCC pavements. 28. Conceptual plot showing relationships of smoothness indices within and between cells. 29. Histogram showing the distribution of slope for IRI versus PI0.0 (for cells in block 1, AC surface pavements). 30. Histogram showing the distribution of slope for IRI versus PI0.0 (for cells in block 2, PCC surface pavements). 31. Histogram showing the distribution of slope for PI0.0 versus PI5-mm (for cells in block 1, AC surface pavements). 32. Histogram showing the distribution of slope for PI0.0 versus PI5-mm (for cells in block 2, PCC surface pavements). 1. Summary of documented PI-IRI relationships. 2. Breakdown of test sections by LTPP experiment. 3. Breakdown of test sections by State. 4. Summary of basic statistics of data used in model development. 5. Matrix of scatter plots created for model development. 6. Factorial of cells used for model development. 7. ANOVA results on the effect of pavement type and climate on PI-IRI relationship for AC pavements. 8. 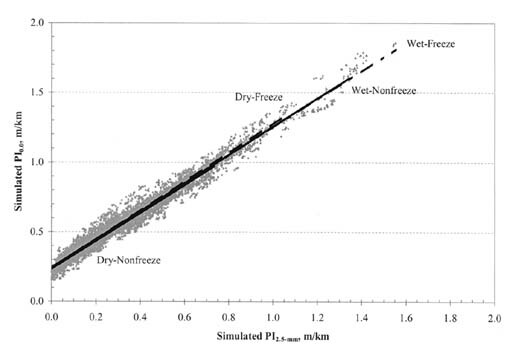 ANOVA results on the effect of pavement type and climate on PI-IRI relationship for PCC pavements. 9. Summary of groupings (merged cells) used for model development. 10. PI-to-IRI index conversion equations and variability indices for AC pavements. 11. PI-to-PI index conversion equations and variability indices for AC pavements. 12. PI-to-IRI index conversion equations and variability indices for PCC pavements. 13. 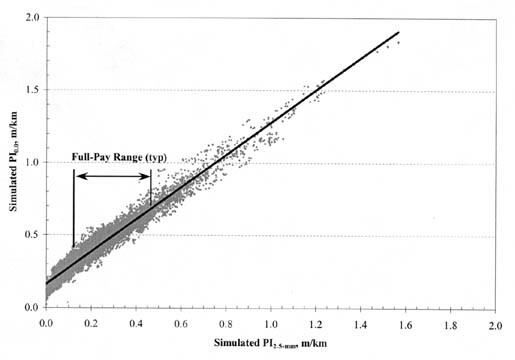 PI-to-PI index conversion equations and variability indices for PCC pavements. 14. State agency smoothness specifications for asphalt pavements. 15. State agency smoothness specifications for concrete pavements. 16. 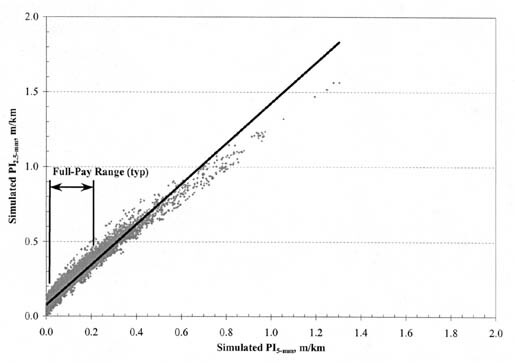 Estimated equivalent PI0.0 and IRI values for PI-based smoothness specifications for new AC pavement. 17. Estimated equivalent PI0.0 and IRI values for PI-based smoothness specifications for AC overlays on AC pavement. 18. Estimated equivalent PI0.0 and IRI values for PI-based smoothness specifications for AC overlays on PCC pavement. 19. Estimated equivalent PI0.0 and IRI values for PI-based smoothness specifications for new PCC pavement and PCC overlays. Initial pavement smoothness is a key factor in the performance and economics of a pavement facility. All other things being equal, the smoother a pavement is built, the smoother it will stay over time. The smoother it stays over time, the longer it will serve the traveling public, thereby benefiting the public in terms of investment (initial construction and upkeep) and vehicular wear costs, as well as comfort and safety. As a means of controlling initial pavement smoothness, several highway agencies began developing and implementing smoothness specifications in the late 1950s and 1960s. These specifications generally included straightedge testing and a form of ride quality testing using response-type mechanical equipment, such as the Bureau of Public Roads (BPR) Roughometer, the Mays Ridemeter, and the Portland Cement Association (PCA) Ridemeter, or simple profiling devices, such as the Chloe profilometer and the profilograph. Between the late 1960s and the 1980s, the profilograph emerged as the clear choice among highway agencies for measuring and controlling initial smoothness, particularly for concrete pavements. This 7.6-meters (25-feet) rolling reference system is capable of producing profile traces, which can be evaluated to identify severe bumps and to establish an overall measure of smoothness (i.e., the profile index [PI]). During this same period of time, more complex profiling systems were being developed and marketed, which provided a much quicker assessment and more accurate representation of pavement smoothness. Inertial profilometers or profilers consist of an integrated set of vertical displacement sensors, vertical accelerometers, and analog computer equipment mounted in a full-sized vehicle (usually a van or large automobile) equipped with a distance-measuring instrument (DMI). These pieces of equipment, which can be operated at highway speed, are capable of producing a more definitive profile of a pavement, from which the universally accepted International Roughness Index (IRI) can be computed. Inertial profilers' first major role in the pavements realm involved long-term condition monitoring of in-service pavements. The reliability and repeatability of these devices greatly enhanced the quality of the pavement management data used by highway agencies in programming maintenance and rehabilitation (M&R) activities. Although the use of inertial profilers in condition monitoring increased substantially in the 1980s and early 1990s, their application in construction acceptance testing remained limited due to their high cost and constraints on the timeliness of testing (i.e., tests on rigid pavements could not be performed until after a few days of curing). Thus, in many agencies, initial pavement smoothness has been measured one way (profilograph PI) and smoothness over time has been measured another way (inertial profiler IRI). In recent years, the technology of inertial profiling systems present on full-sized vehicles has been adopted on smaller motorized vehicles, such as the John Deere and Kawasaki utility carts and four-wheel all-terrain vehicles (ATVs). These lightweight profilers, which are currently being evaluated by several agencies and have been approved for use by a few, enable testing personnel to obtain timely and highly definitive measurements of surface profiles at rates of speed significantly higher than profilographs (24 kilometers/hour [15 miles/hour] versus 5 km/hr [3 mi/hr]). The profilers are capable of producing IRI and other indices (e.g., simulated PI and Mays output, ride number [RN]) commonly used in controlling and monitoring pavement smoothness. Although the profilograph has served the highway community fairly well as an easily understood index of initial pavement smoothness, concerns about its accuracy and relationship with user response (fair to poor) have grown significantly in the last decade. For instance, because the device measures only wavelengths within the range of 0.3 to 23 m (1 to 75 ft) and because it amplifies wavelengths that are factors of its length (i.e., 7.6 m [25 ft]), the profile it produces is biased from a pavement's true profile. This can be seen in figure 1, where a true profile would be represented by a gain of 1.0. Coupled with the fact that a 2.5- or 5-millimeter (0.1- or 0.2-inch) blanking band is often applied when computing PI, thereby masking some roughness, it is understandable how correlation with user response is generally deemed inadequate. Over the last 6 years, a handful of State agencies have moved toward using a zero blanking band PI (PI0.0) statistic for construction acceptance testing. This has reportedly improved the ability to control initial smoothness and bettered the relationship between profilograph PI and user response. However, the fact that the same biased profiles are being used to compute PI0.0 does not fully alleviate the major concerns with the profilograph. Among many agencies, the belief persists that inertial profilers are the best means for specifying and evaluating initial smoothness. Figure 1. Sensitivity of simulated profilograph to spatial frequency. Additional support for using inertial profilers in construction acceptance testing comes from the desire for a "cradle-to-grave" smoothness index. Since it has been shown that future smoothness is a function of initial smoothness, use of one index for tracking smoothness over the entire life of a pavement would significantly benefit pavement managers and designers through improved performance prediction modeling. Recent surveys of State highway agencies indicate that about 10 percent (4 of 34 respondents) use IRI to control initial smoothness (Baus and Hong, 1999), while about 84 percent (31 of 37 respondents) use IRI to monitor pavement smoothness over time (Ksaibati et al., 1999).). It is quite evident that IRI will become the statistic of choice in future smoothness specifications, given that: many agencies are investigating lightweight inertial profilers, and that the proposed 2002 Design Guide under development by the National Cooperative Highway Research Program (NCHRP) will include IRI prediction models that are a function of initial IRI (IRI0). So, how do agencies make the switch from their current PI-based specifications to IRI specifications? What levels of IRI should be specified which would be comparable or equivalent to the PI values currently stipulated? How confident can an agency be that newly established IRI levels reflect the levels of ride quality previously specified? These are all questions that must be properly addressed in light of the fact that several past pavement smoothness studies show poor correlation between PI values produced by a profilograph and IRI values generated by inertial profilers. This study attempts to provide answers to the above questions through the analysis of comprehensive time history smoothness data collected by high-speed inertial profilers under the Long-Term Pavement Performance (LTPP) program. These smoothness data include archived surface profile data and corresponding computed IRI values for many General Pavement Studies (GPS) and Specific Pavement Studies (SPS) test pavements located throughout the United States. Using advanced computer simulation algorithms, it is possible to compute PI values from the surface profile data, thereby allowing detailed comparisons between IRI and PI. Analyze LTPP profile data from GPS and SPS test sections for IRI and PI using the 0.0-mm (0.0-inch), 2.5-mm (0.1-inch), and 5.0-mm (0.2-inch) blanking bands. 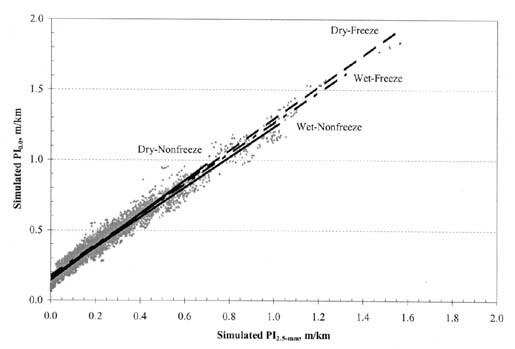 This includes profile data from aphalt concrete (AC) and portland cement concrete (PCC) test sections in the four LTPP climatic zones: dry freeze (DF), dry nonfreeze (DNF), wet freeze (WF), and wet nonfreeze (WNF). Compile and provide recommendations for smoothness specification acceptance limits for new and rehabilitated PCC and hot-mix asphalt (HMA) pavements, based upon IRI and PI. To begin the investigation of the relationship between IRI and PI, a fairly extensive literature search was performed focusing on national and State-sponsored pavement smoothness studies conducted in the last 15 years. This search resulted in the collection of many reports, papers, and articles on the topic of smoothness, but only a handful dealing specifically with the correlation of IRI and PI. Presented in this section is a synopsis of seven documented studies and the PI-to-IRI correlations developed in those efforts. Most of the correlations involve PI readings from actual profilograph equipment; however, a few are based on computer-simulated PI values produced from surface profiles measured by inertial profilers. As part of a major effort to develop calibration procedures for profilographs and evaluate equipment for measuring the smoothness of new pavement surfaces, the Pennsylvania Transportation Institute (PTI) conducted a full-scale field-testing program on behalf of the Federal Highway Administration (FHWA) (Kulakowski and Wambold, 1989). Concrete and asphalt pavements at five different locations throughout Pennsylvania were selected for the experiment; each pavement was new or newly surfaced. Multiple 0.16-km (0.1-mi) long pavement sections were established at each location, resulting in 26 individual test sections over which 2 different types of profilographs (California and Rainhart), a Mays Meter, and an inertial profiler were operated. The resulting smoothness measurements were evaluated for correlation. Figure 2 shows the relationship between the inertial profiler IRI and the PI5-mm (PI0.2-inch) determined manually from the California-type profilograph. As can be seen, the resulting linear regression equation had a coefficient of determination (R2) of 0.57. Figure 3 shows the relationship between the inertial profiler IRI and the computer-generated PI5-mm (PI0.2-inch) from the California-type profilograph. Although the resulting linear regression equation had a similar coefficient of determination (R2 = 0.58), its slope was considerably flatter. For any given IRI, the data show a wide range of PI5-mm (PI0.2-inch). 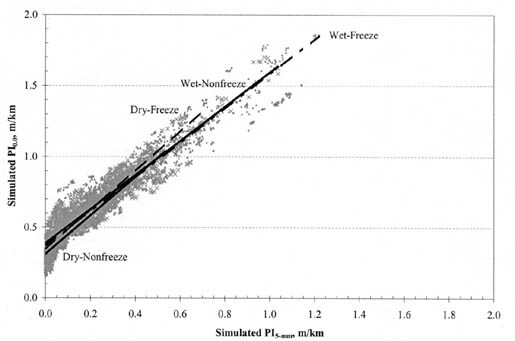 Although both of these relationships were based on measurements from both concrete and asphalt pavement sections, neither one is considerably different from regressions based solely on data from the concrete sections. Figure 2. 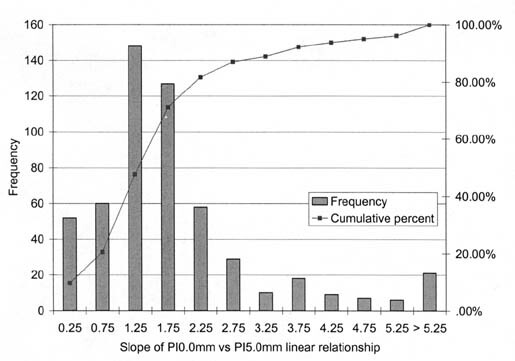 Relationship between IRI and manually generated PI5-mm (PI0.2-inch) in PTI profilograph calibration study (Kulakowski and Wambold, 1989). Figure 3. 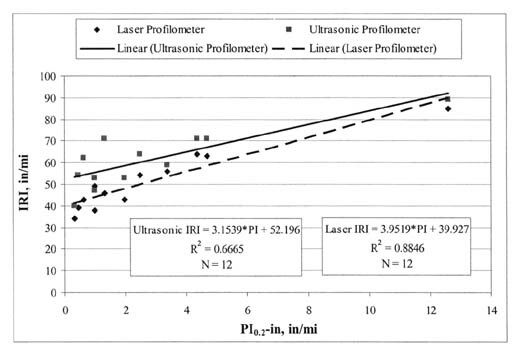 Relationship between IRI and computer-generated PI5-mm (PI0.2-inch) in PTI profilograph calibration study (Kulakowski and Wambold, 1989). In 1992, the Arizona Department of Transportation (AZDOT) initiated a study to determine the feasibility of including their K.J. Law 690 DNC Profilometer (optical-based inertial profiler) as one of the principal smoothness measuring devices for measuring initial pavement smoothness on PCC pavements (Kombe and Kalevela, 1993). At the time, the AZDOT used a Cox California-type profilograph to test newly constructed PCC pavements for compliance with construction smoothness standards. To examine the correlative strength of the Profilometer (IRI) and profilograph (PI) outputs, a group of twelve 0.16-km (0.1-mi) pavement sections around the Phoenix area were selected for testing. 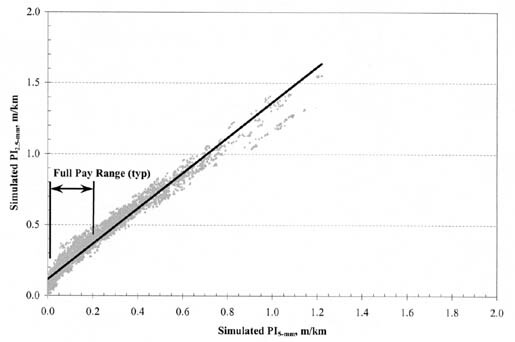 The smoothness levels of the sections spanned a range that is typical of newly built concrete pavement-PI5-mm (PI0.2-inch) between 0 and 0.24 m/km (15 inches per mile). A total of three smoothness measurements were made with the Profilometer over each wheelpath of each selected section, whereas a total of five measurements were made by the profilograph over each wheelpath of each section. The mean values of each set of three or five measurements were then used to correlate the IRI and PI5-mm (PI0.2-inch) values. 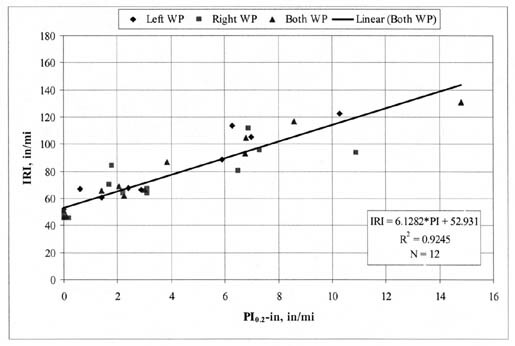 Simple linear regression analyses performed between the left wheelpath, right wheelpath, and both wheelpath sets of values indicated generally good correlation between the two indexes. Figure 4 shows the scatter plots of each group, as well as the regression line associated with the both wheelpath data group. As can be seen, the R2 for the both wheelpath regression line was very high (0.93). Figure 4. 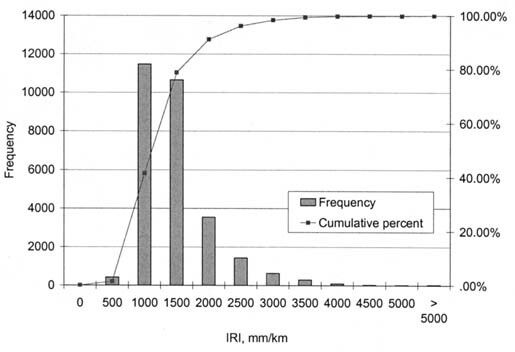 Correlation of IRI and PI5-mm (PI0.2-inch) in Arizona pavement smoothness study (Kombe and Kalevela, 1993). 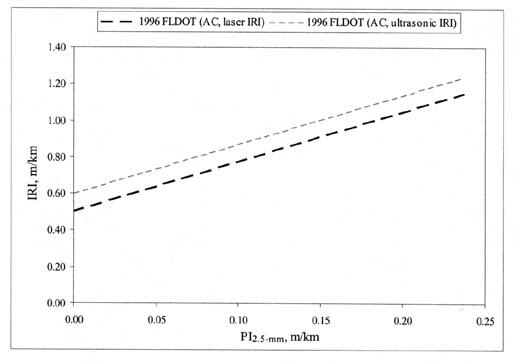 In the course of developing new smoothness specifications for rigid and flexible pavements in Texas, researchers at the University of Texas conducted a detailed field investigation comparing the McCracken California-type profilograph and the Face Dipstick, a manual Class I profile measurement device (Scofield, 1993). The two devices were used to collect smoothness measurements on 18 sections of roadway consisting of both asphalt and concrete pavements. For both devices, only one test per wheelpath was performed. Results of linear regression analysis showed a strong correlation (R2 = 0.92) between the IRI and PI5-mm (PI0.2-inch) values. 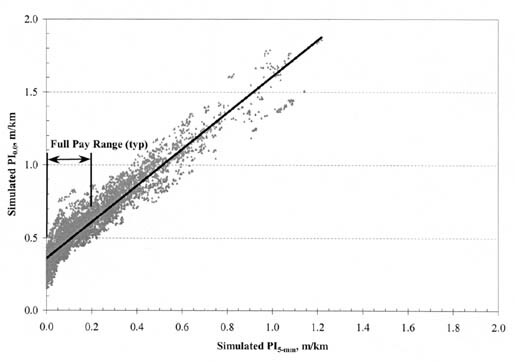 The resulting linear regression equation had a higher intercept value than those obtained in the PTI and AZDOT studies, while the slope of the equation was more in line with the slopes generated in the PTI study. Looking to upgrade its smoothness testing and acceptance process for flexible pavements, the Florida DOT (FLDOT) undertook a study designed to compare its current testing method (rolling straightedge) with other available methods, including the California profilograph and the high-speed inertial profiler (FLDOT, 1997). A total of twelve 0.81-km (0.5-mi) long pavement sections located on various Florida State highways were chosen for testing. All but one of the sections represented newly constructed or resurfaced asphalt pavements. The left and right wheelpaths of each test section were measured for smoothness by each piece of equipment. The resulting smoothness values associated with each wheelpath were then averaged, yielding the values to be used for comparing the different pieces of equipment. The inertial profiler used in the study was a model manufactured by the International Cybernetics Corporation (ICC). Because one of the objectives of the study was to evaluate different technologies, the ICC inertial profiler was equipped with both laser and ultrasonic sensors. Separate runs were made with each sensor type, producing two sets of IRI data for comparison. 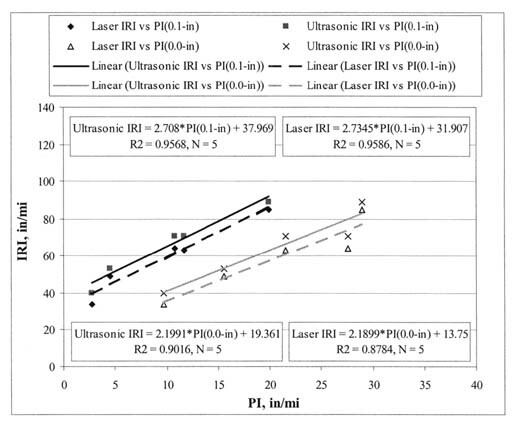 Figure 5 shows the relationships developed between the profilograph PI5-mm (PI0.2-inch) and the IRI values respectively derived from the laser and ultrasonic sensors. As can be seen, both correlations were fairly strong (R2 values of 0.88 and 0.67), and the linear regression equations were somewhat similar in terms of slope. As is often the case, however, the ultrasonic-based smoothness measurements were consistently higher than the laser-based measurements, due to the added sensitivity to items such as surface texture, cracking, and temperature. This resulted in a higher y-intercept for the ultrasonic-based system. 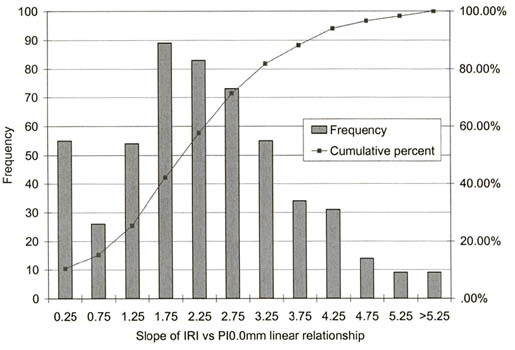 Figure 6 shows the correlations developed between IRI and PI2.5-mm (PI0.1-inch) and IRI and PI0.0. 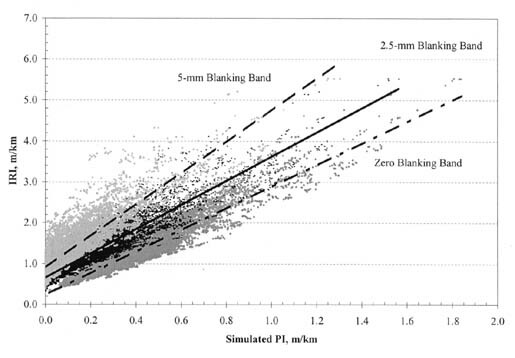 It is quite clear from this and the previous figure that the application of smaller blanking bands results in higher PI values, since additional components of roughness are considered. More significant, however, is the fact that both the slopes and the y-intercept values in the resulting linear regression equations decrease with smaller blanking bands. This is, again, the result of additional profile roughness being considered. Figure 5. 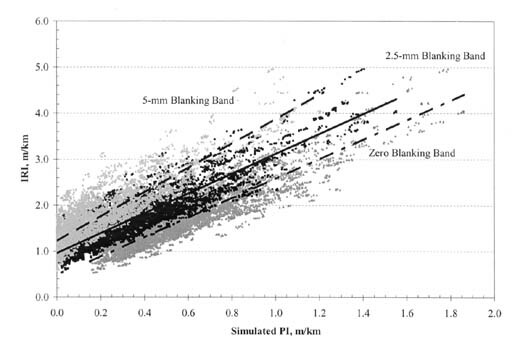 IRI-PI5-mm (PI0.2-inch) correlations established in Florida's ride quality equipment study (FLDOT, 1997). Figure 6. 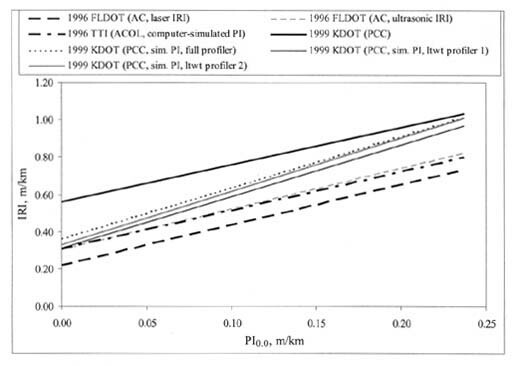 IRI-PI2.5-mm (PI0.1-inch) and IRI-PI0.0 correlations established in Florida's ride quality equipment study (FLDOT, 1997). 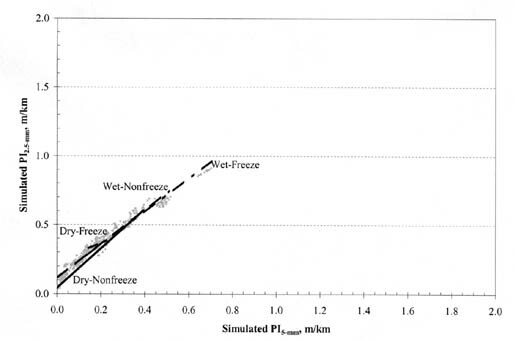 It is reasonable to surmise from these observations that, if the PI0.0 was computed from a more accurate pavement profile than the one generated by a profilograph, the y-intercept would be much closer to zero. This is because the roughness associated with long wavelengths (e.g., long dips or humps) is automatically filtered out as a result of the short baselength of profilographs. 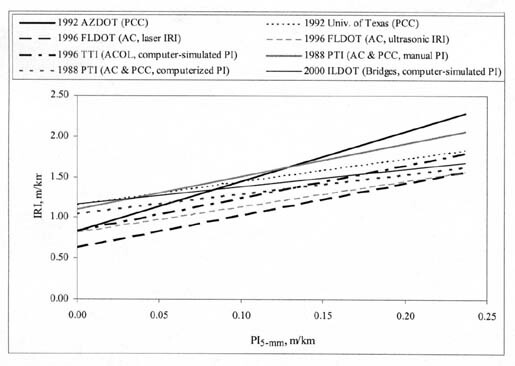 As part of a multi-staged effort to transition from a profilograph-based smoothness specification to a profile-based specification, the Texas Transportation Institute (TTI) was commissioned by the Texas DOT (TXDOT) in 1996 to evaluate the relationship between IRI and profilograph PI (Fernando, 2000). 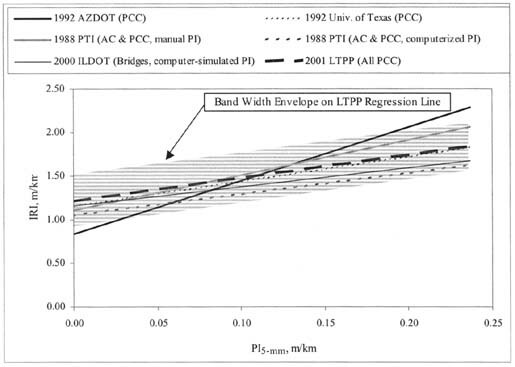 The study entailed obtaining longitudinal surface profiles (generated by one of the Department's high-speed inertial profiler) from 48 newly AC resurfaced pavement sections throughout Texas, generating computer-simulated profilograph traces from those profiles using a field-verified kinematic simulation model, and computing PI5-mm (PI0.2-inch) and PI0.0 values using the Pro-Scan computer software. 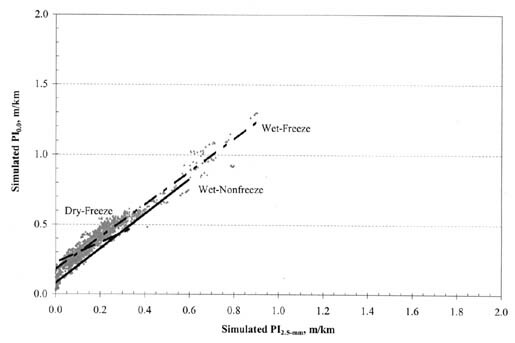 A total of three simulated runs per wheelpath per section were performed, from which an average PI value for each section was computed. The resulting section PI values were then compared with the corresponding section IRI values, which had been computed by the inertial profiling system at the time the longitudinal surface profiles were produced in the field. Since both the PI and IRI values were based on the same longitudinal profiles, potential errors due to differences in wheelpath tracking were eliminated. Illustrated in figure 7 are the relationships between the IRI and the simulated PI response parameters. As can be seen, a much stronger trend was found to exist between IRI and PI0.0 than between IRI and PI5-mm (PI0.2-inch). Again, this is not unexpected since the application of a blanking band has the natural effect of masking certain components of roughness. In comparison with the other IRI-PI5-mm (IRI-PI0.2-inch) correlations previously presented, the one developed in this study is quite typical. The linear regression equation includes a slightly higher slope but a comparable y-intercept value. 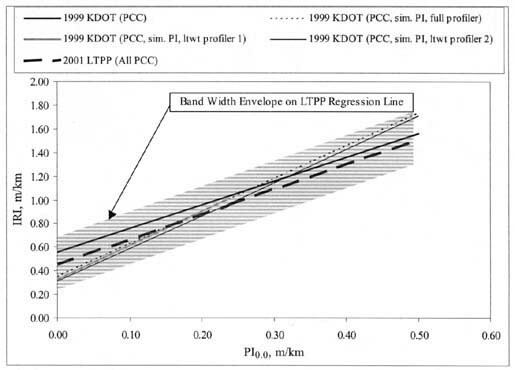 The major objective of this 1999/2000 study was to compare as-constructed smoothness measurements of concrete pavements taken by the Kansas DOT's (KDOT) manual California-type profilograph, four lightweight inertial profilers (Ames Lightweight Inertial Surface Analyzer [LISA], K.J. Law T6400, ICC Lightweight, and Surface Systems Inc. [SSI] Lightweight), and two full-sized inertial profilers (Kansas DOT South Dakota-type profiler, K.J. Law T6600) (Hossain et al., 2000). 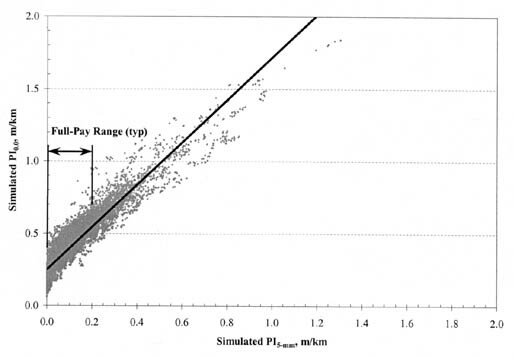 The simulated PI0.0 values produced by the various lightweight systems were statistically compared with the California-type profilograph PI0.0 readings to determine the acceptability of using lightweight systems to control initial pavement smoothness. In addition, IRI values generated by the lightweight systems were statistically compared with those generated by the full-sized, high-speed profilers to investigate whether the IRI statistic can be used as a "cradle-to-grave" statistic for road roughness. Figure 7. 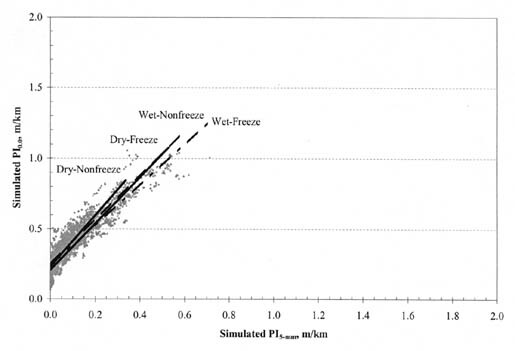 Relationship between IRI and computer-simulated PI values in TTI equipment comparison study (Fernando, 2000). The field evaluation was performed at eight sites along I-70 west of Topeka. Each lane (driving and passing) at each site was tested with the KDOT's profilograph and full-sized profiler, while the remaining profilers tested at only some of the eight sites. At a given site, one run of each wheelpath was made with the profilograph, and the average of the two runs was determined and reported. For the lightweight and full-sized profilers, three and five runs were made, respectively, with both wheelpaths measured and averaged during each run. 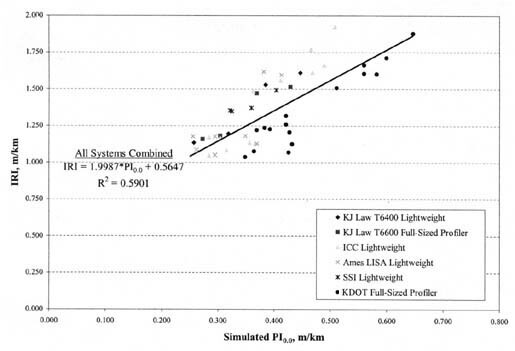 Statistical analysis of the data indicated that the lightweight systems tended to produce statistically similar PI0.0 values when compared to the KDOT manual profilograph. It also showed similarities in IRI between the KDOT full-sized profiler and three of the four lightweight profilers, giving some credence to the "cradle-to-grave" roughness concept. The study included correlation analysis between the PIs from the manual profilograph and those from the lightweight systems. It also included correlation analysis between the simulated PI and IRI values produced by each inertial profiler. Plots of these data are provided in figure 8, which also shows the linear IRI-PI0.0 relationship that results when data from all profiling devices are considered. No correlations were made in the KDOT study between profilograph PI0.0 and inertial profiler IRI. However, using data from the report, several such trends have now been developed and are illustrated in figure in 9. Each data point in this figure represents the mean smoothness (profilograph PI0.0 and profiler IRI) of one lane at one test site. As can be seen, only the IRI data taken by two of the lightweight profilers (Ames LISA and ICC) and the KDOT full-sized profiler are represented. The other three profilers collected data from only two of the eight sites, which resulted in very limited data sets. Figure 8. Plots of IRI and simulated PI0.0 values generated by various profilers in KDOT lightweight profiler comparison study. Figure 9. 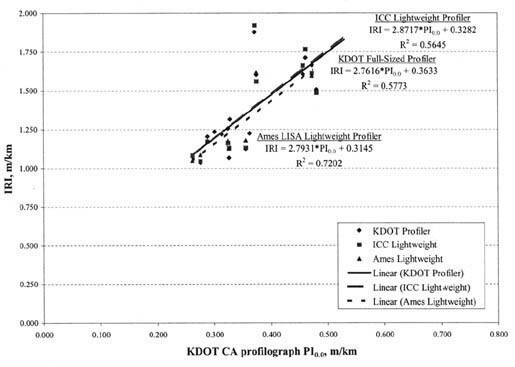 Relationship between IRI and California profilograph PI0.0 in KDOT lightweight profiler comparison study. As part of an effort to develop a preliminary bridge smoothness specification for the Illinois DOT (ILDOT), the University of Illinois coordinated a series of bridge smoothness tests in 1999 using the K.J. 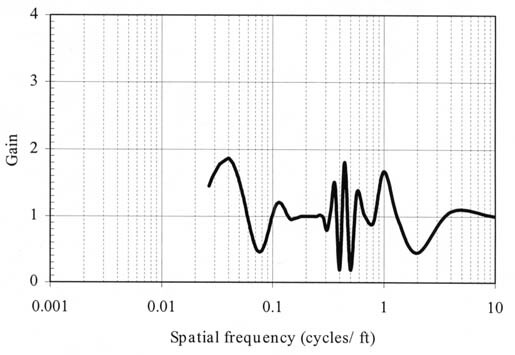 Law T6400 lightweight inertial profiler (Rufino et al., 2001). A total of 20 bridges in the Springfield, Illinois area were chosen and tested, with each bridge measured for IRI and PI5-mm (PI0.2-inch). At least one run per wheelpath of the driving lane was made, and each run extended from the front approach pavement across the bridge deck to the rear approach pavement. A correlation analysis of the IRI and simulated PI5-mm (PI0.2-inch) values produced by the lightweight profiler was performed in the study, which resulted in the graph and linear relationship given in figure 10. Unlike other relationships presented earlier in this chapter, this relationship covers a larger spectrum of PI values -- PI5-mm (PI0.2-inch) values largely in the range of 0.4 to 1.0 m/km (25 to 63 inches per mile) -- due to the fact that bridges are often much rougher than pavements. Figure 10. 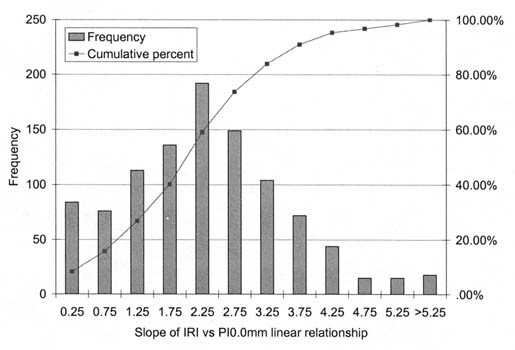 Relationship between IRI and simulated PI5-mm (PI0.2-inch) in ILDOT bridge smoothness study (Rufino et al., 2000). Table 1 summarizes the various regression equations found in the literature relating IRI from an inertial profiling system with PI statistics (PI5-mm, PI2.5-mm, and PI0.0) generated by California-type profilographs or simulated by inertial profilers. How these various relationships compare visually with one another can be seen in figures 11 through 13. Generally speaking, there is considerable disparity in the vertical positioning of each trend, but the slopes are rather similar. The fact that different pavement types, different roughness ranges, and different pieces of testing equipment are represented by the various trends is believed to account in large part for the disparities observed. Table 1. Summary of documented PI-IRI relationships. Figure 11. Graphical illustration of documented PI5-mm -- IRI smoothness relationships. Figure 12. Graphical illustration of documented PI2.5-mm -- IRI smoothness relationships. Figure 13. Graphical illustration of documented PI0.0-IRI smoothness relationships. As mentioned previously, the main thrust of this study involves the comprehensive analysis of LTPP smoothness data. Since the time the LTPP program was initiated in 1989, several hundred test pavements throughout the country have been tested for smoothness on an annual or biennial basis using full-sized, high-speed inertial profilers. In each test, the longitudinal surface profile of each wheelpatch was measured and recorded, and from those profiles the IRI of each wheelpath was computed and recorded for inclusion in the LTPP Information Management System (IMS) database. The sections below describe in detail the collection of LTPP data and the development of the project database used to examine the relationship between IRI and PI. To retrieve the profile and smoothness data required for this study, a data request was submitted to the LTPP IMS database manager. All 1996 - 2001 archived profile data contained in the Ancillary Information Management System (AIMS) and IRI data contained in the IMS were requested, covering all LTPP test sections. Data for this time period only were requested, as they represented data collected by a specific model of profiling equipment -- the 1995 version of the K.J. Law T-6600 inertial profiler. Four such profilers were purchased by LTPP in 1996 for use by each LTPP Regional Contracting Office (North Central, North Atlantic, Southern, Western). The 1995 T-6600 profiler is considered a class I accelerometer-established inertial profiling reference based on American Society of Testing and Materials (ASTM) E-950-98. It is a van-mounted system containing two infrared sensors spaced 1,676 mm (66 inches) apart. The system collects longitudinal profile data at 25.4-mm (1-inch) intervals, and these data are processed through a moving-average smoothing filter to generate 152-mm (6-inch) profile data, which are subsequently downloaded and stored in the IMS database. Also stored in the IMS database are the individual wheelpath IRI values computed from the 152-mm (6-inch) profile data. The original 25.4-mm (1-inch) profile data are also archived, but they are done so in the AIMS databases managed by each Regional Contracting Office. Because current automated profilographs record profile traces on 32-mm (1.25-inch) intervals, the AIMS profile data represent a closer match of the profile traces than the 152-mm (6-inch) IMS profile data. Hence, in addition to requesting IRI and relevant test section data (e.g., State ID, SHRP ID, experiment number, pavement type, climatic information) contained in the IMS database, all available 25.4-mm (1-inch) profile data were solicited. To model profilograph traces and generate simulated PI values from the AIMS profile data, a calibrated software modeling system was used. In 1995, K.J. Law developed software to model California-type profilograph traces and output PI values. This software is now used with their lightweight profilers to compute PI and IRI. K.J. Law's lightweight profilers use the same vertical elevation sensors that are mounted on the T-6600 profiler, which again has been the device used to collect profiles for the LTPP program. Although there are several good lightweight profilers and PI modeling systems available, the K.J. Law modeling software was selected for this study to provide the most compatibility with the available LTPP profile data. Using the modeling and index computation software currently installed on their commercial lightweight profilers, K.J. Law developed interface for analysis of the LTPP data. Named "Indexer," the software computes PI, IRI, and ride number (RN) values using University of Michigan Transportation Research Institute (UMTRI) Engineering Research Department (ERD) format input files. The operator can set the blanking band, as well as several other parameters, such as the type of smoothing filter (moving average or third-order Butterworth) and the type of scallop filter (height, length, rounding). 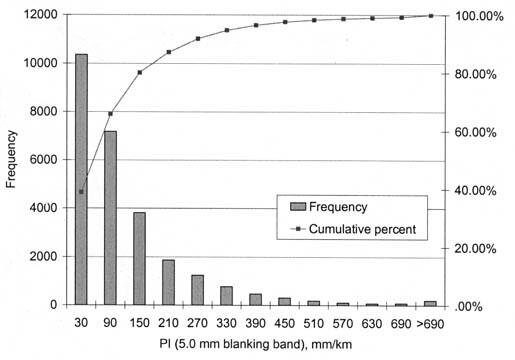 In this study, the 25.4-mm (1-inch) AIMS profile data were processed into 0.0-, 2.5-, and 5-mm (0.0-, 0.1-, and 0.2-inch) blanking band PI values (herein designated as PI0.0, PI2.5-mm, and PI5-mm) for each profile data set using the K.J. Law Indexer 3.0 software. These simulated PI values were computed using a 0.76-m (2.5-ft) moving-average filter, along with minimum height, maximum height, and rounding scallop filters settings of 0.9, 0.6, and 0.25 mm (0.035, 0.024, and 0.01 inches), respectively. During the conversion of profile data into simulated PI values, the issue of subsectioning of SPS profile data was addressed. Unlike GPS test sites, which serve as individual 152.5-m (500-ft) test sections, each SPS test site contains between 3 and 20 test sections comprised of different designs, materials, and construction practices. Profile data for each SPS site are collected in one pass, and the data are subsectioned only after conversion to 152-mm (6-inch) intervals. To extract 25.4-mm (1-inch) profile data for each SPS test section, a special subsectioning program was developed and applied to each continuous SPS test site profile. Each subsectioned profile was then processed for IRI, PI0.0, PI2.5-mm, and PI5-mm using the Indexer program. As a data quality control measure, each IRI value computed by Indexer was compared with the IRI value computed in the field and subsequently reported in the IMS database. All profiler runs that showed more than 0.0075 m/km (0.475 inches per mile) difference between the Indexer-computed IRI and the IMS database IRI were excluded from the project database. IRI and relevant test section data obtained from the IMS database were downloaded into Microsoft® Access, a database management system that provides easy extraction of data into spreadsheets and statistical analysis input files. The IRI data consist of right and left wheelpath IRI values generated from individual profiler runs conducted on GPS and SPS sites between 1996 and 2001. Simulated PI0.0, PI2.5-mm, and PI5-mm values derived from the 25.4-mm (1-inch) profile data were also added to the project database. Moreover, to successfully carry out the data analyses for the project, mean IRI and mean simulated PI values were computed from each pair of left- and right-wheelpath smoothness values. The resulting means were then added to the project database. A total of 1,793 LTPP test sections located in 47 States and 8 Canadian Provinces formed the basis for this evaluation. The sections represent a variety of pavement types, including original and restored AC and PCC pavements, asphalt overlays of both AC and PCC pavements, and concrete overlays of PCC pavements. They also span all four climatic zones-dry freeze, dry nonfreeze, wet freeze, wet nonfreeze -- as defined by mean annual precipitation (wet being greater than 508 mm [20 inches] of precipitation per year) and mean annual freezing index (FI) (freeze being more than 66°C-days [150°F-days] per year). Each test section in the database includes IRI and simulated PI values corresponding to individual profiler runs made between 1996 and 2001. Breakdowns of the test sections by LTPP experiment and by State are provided in tables 2 and 3, respectively. Table 2. Breakdown of test sections by LTPP experiment. Table 3. Breakdown of test sections by State. Perform preliminary evaluation of the assembled database, including a detailed check of data quality, appropriate data cleaning, and development of comprehensive scatter plots. Select the most appropriate model form for the smoothness indices relationships. Selection will be based on trends observed from the preliminary data analysis and past research. Analyze the results of the preliminary data analysis (bivariate plots) and conduct an analysis of variance (ANOVA) to determine the groupings of pavement types, climatic regions, and other factors with similar smoothness indices relationships (e.g., no significant differences in slopes for linear relationships). Develop tentative models for the smoothness indices relationships. Assess tentative models for reasonableness (e.g., assess model diagnostic statistics, such as correlation coefficient [R2] and the standard error of the estimate [SEE]). 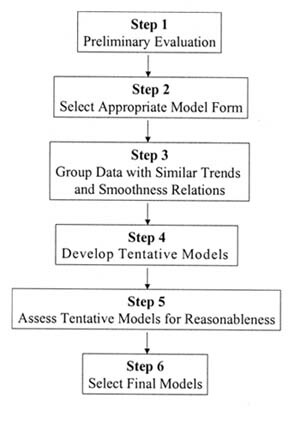 The steps outlined for model development are summarized in the flow chart shown in figure 14 and are explained in greater detail in the sections that follow. This approach has been used in previous research studies and has been improved to provide practical and accurate models. Figure 14. Flow chart for developing pavement smoothness models. In step 1 of model development, the assembled database was examined to determine its general properties and to identify possible data anomalies (i.e., outliers, missing or erroneous data). The data were "cleaned" as appropriate and then sorted to allow for the development of various PI- PI0.0 and PI-IRI scatter plots for use in model development. The ranges of PI and IRI data to be used in model development and whether those ranges were consistent with the purposes for which the data would be used. Climatic regions of the pavements from which data were obtained. Figures 15 through 18 present histograms showing the distribution of IRI and PI5-mm for all AC- and PCC-surfaced pavements. A detailed summary of the information depicted in the plots (categorized by pavement type and climatic region) is provided in table 4. It is clear from these exhibits that the data used for analysis (i.e., the cleaned data), and for developing PI-PI0.0 and PI-IRI relationships, fully cover the ranges of smoothness typical of new construction and AC overlays (i.e., IRI between 800 and 2,000 mm/km [50 and 125 inches per mile], PI5-mm between 0 and 235 mm/km [0 and 15 inches per mile]). As summarized in table 5, 111 scatter plots of IRI versus PI5-mm, PI2.5-mm, and PI0.0, and 111 scatter plots of PI0.0 versus PI5-mm and PI2.5-mm were produced to aid the model development process. 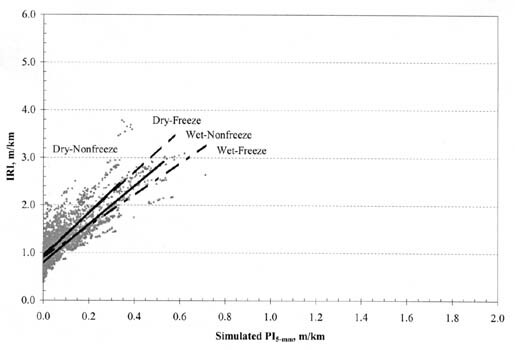 The scatter plots represent various combinations of climatic zone and pavement type. Complete sets of the scatter plots developed in the study are provided in appendixes A and B. 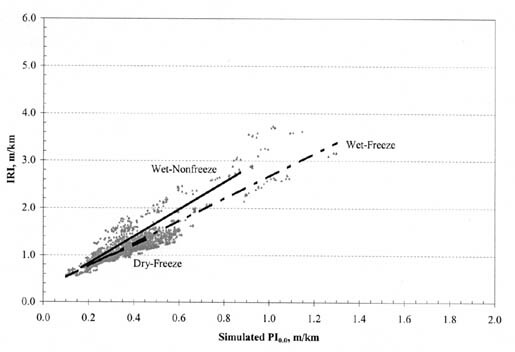 At the broadest level, over 14,000 asphalt pavement smoothness data points (representing the average roughness of right and left wheelpaths) and over 8,000 concrete pavement data points representing all four climatic zones were available for plotting and model development. Figure 19 shows the PI0.0-IRI scatter plot for all AC pavements, and figure 20 shows the PI5-mm-PI0.0 scatter plot for all PCC pavements. These plots, which are typical of most of the scatter plots, show reasonably strong (R2 > 0.75) and virtually linear relationships between the smoothness indices. They also, however, illustrate the considerable amount of variation due in large part to the inherent differences in the way the smoothness indices process different surface wavelengths. 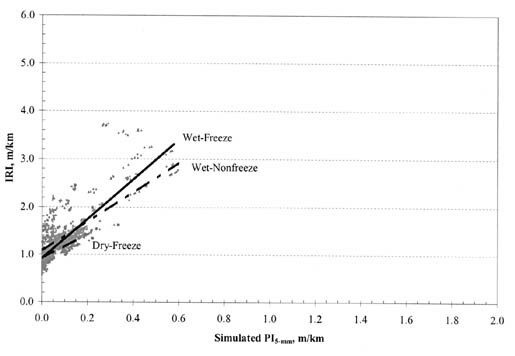 Examples of the effects of pavement type and climatic zone on the smoothness relationships can be seen in figures 21 and 22. 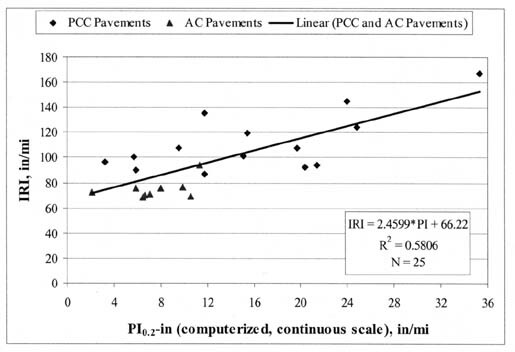 In the case of the PI0.0-IRI trends for different AC pavements (figure 21), the differences are almost negligible. Slightly more distinct differences, however, are discernible among the PI5-mm-PI0.0 trends representing different climatic zones (figure 22). Figure 15. Histogram showing the distribution of IRI data used in model development (all AC pavements). Figure 16. Histogram showing the distribution of IRI data used in model development (all PCC pavements). Figure 17. Histogram showing the distribution of PI5-mm data used in model development (all AC pavements). Figure 18. Histogram showing the distribution of PI5-mm data used in model development (all PCC pavements). Table 4. Summary of basic statistics of data used in model development. Notes: - = No data available; a = New construction only. Table 5. Matrix of scatter plots created for model development. Note: - = No data available. Figure 19. IRI vs. PI0.0 for all AC pavements and climates. Figure 20. PI0.0 vs. PI5-mm for all PCC pavements and climates. Figure 21. IRI vs. PI0.0 by AC pavement type for all climates. Figure 22. PI0.0 vs. PI5-mm by climate for all PCC pavement types. Figures 23 through 27 provide for a direct visual comparison of the smoothness relationships developed in past studies with the LTPP-derived relationships. 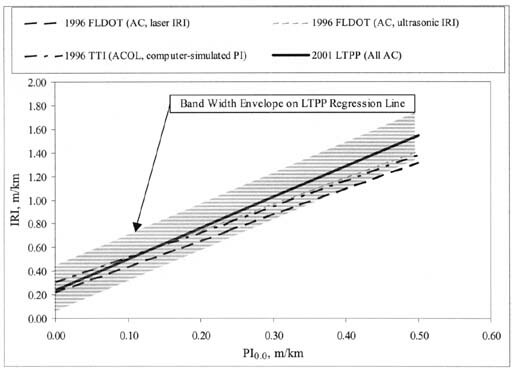 In each figure, a bandwidth envelope centered one standard deviation around the LTPP-derived regression line has been transposed over the individual regression lines of the past documented smoothness studies. Though the LTPP relationships represent a wide range of smoothness, only the levels typical of new construction (IRI < 2.0 m/km [127 inches per mile]) are illustrated in figures 23 through 27. As can be seen, in most instances, the LTPP regression envelope covers the individual PI-IRI relationships. 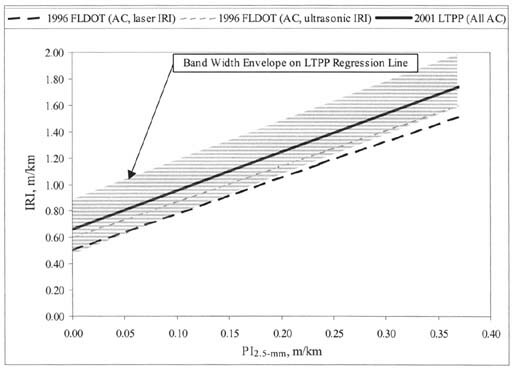 In the case of the PI5-mm-IRI relationships for asphalt (figure 23), the PTI relationship and one of the Florida relationships (IRI using ultrasonic profiler) extended outside the LTPP envelope. Equipment is likely a contributing factor with respect to the Florida relationship, as ultrasonic sensors were used as opposed to the infrared sensors used in the LTPP program). 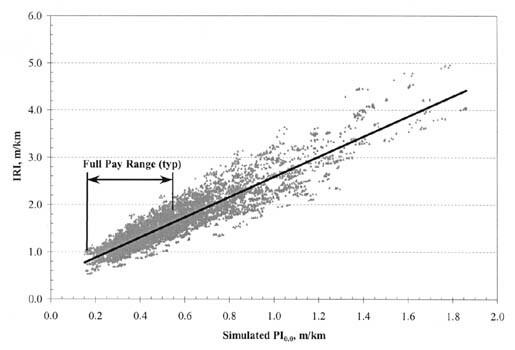 And, as noted in the figure, the PTI relationship was based on measurements for both AC and PCC pavements. In the PI5-mm-IRI relationships for concrete (figure 23), the Arizona relationship contrasted sharply with the LTPP relationship. The fact that the Arizona relationship was based on measurements from only 12 concrete pavement sections may help explain this departure. However, other factors, such as sensor type (Arizona used optical sensors), are likely to have also contributed to this phenomenon. Figure 23. Graphical comparison of PI5-mm-IRI smoothness relationships for AC pavements. Figure 24. Graphical comparison of PI5-mm-IRI smoothness relationships for PCC pavements. Figure 25. 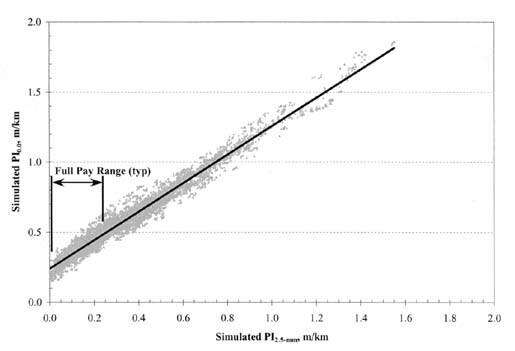 Graphical comparison of PI2.5-mm-IRI smoothness relationships for AC pavements. Figure 26. 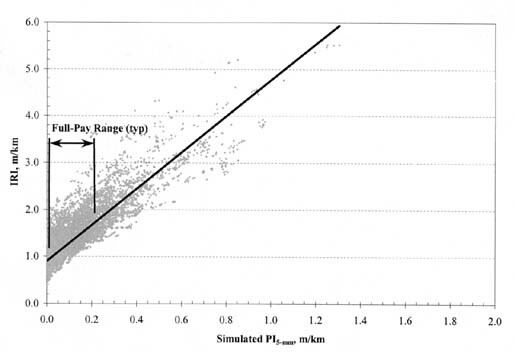 Graphical comparison of PI0.0-IRI smoothness relationships for AC pavements. Figure 27. Graphical comparison of PI0.0-IRI smoothness relationships for PCC pavements. Model development began with the selection of the most suitable functional form that best describes the relationship between IRI and PI. As indicated by the scatter plots presented in figures A-1 through A-37 and B-1 to B-37 in appendixes A and B, the PI-IRI relationship is virtually linear and, thus, a linear function with IRI as the dependent variable and PI as the independent variable was adopted. A similar functional form was selected for developing the PI0.0 versus PI models, as indicated by the corresponding scatter plots in appendixes A and B. 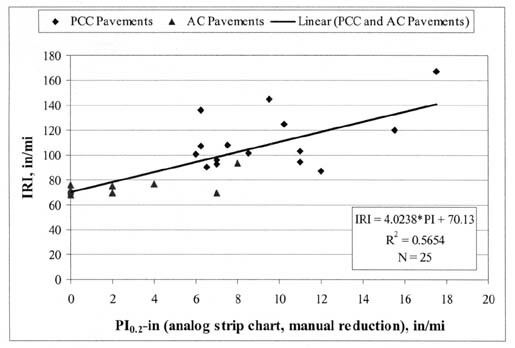 The linear relationship as shown in the figures was true for both AC and PCC surface pavements. The magnitude of the slope, however, varied according to pavement type (AC vs. PCC, or Jointed Plain Concrete (JPC) vs. Continuosly Reinforced Concrete (CRC)) and the climatic region in which the pavement was located. The model form selected is shown as equation 1. IRI = International roughness index, mm/km. 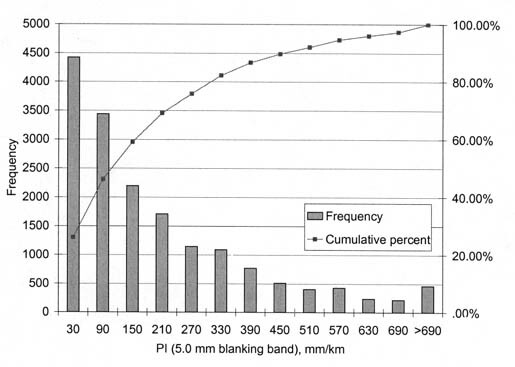 PIX = Profile index for blanking band X (X = 0.0, 2.5, or 5.0 mm). alpha, beta = regression constants. Ideally, a single model could be developed to relate the various smoothness indices (e.g., IRI versus PI0.0 for all pavement types, climatic regions). However, unless the influences of different climatic zones and pavement types were statistically insignificant, this would result in the development of models with low prediction capabilities and the introduction of significant levels of error in predicted indices. On the other hand, developing models for all the different combinations of pavement types (e.g., AC, AC/AC, JPC, CRC) would result in the development of a minimum of 144 models, as illustrated in table 6. So many models is not only impractical from a user's point of view, but could not be developed with the level of accuracy required, due to the lack of sufficient amounts of data in some of the cells in table 6. Table 6. Factorial of cells used for model development. 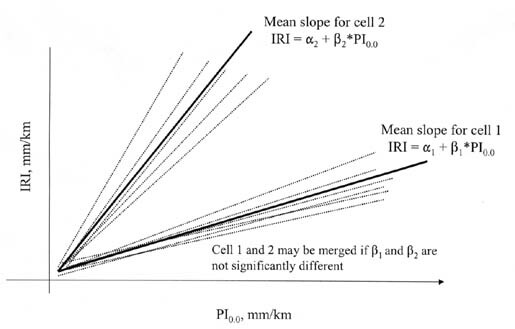 Similar relationships between the smoothness indices listed above was defined as cells with the same surface type with statistically insignificant differences in mean slope or gradient of a linear model developed relating the two given indices. This is shown conceptually in figure 28. Thus, cells with similar PI-IRI or PI-PI relationships were merged for model development, so as to limit the number of models. As shown in table 6, cells were defined according to pavement type (e.g., AC, AC/PCC, Jointed Reinforced Concrete (JRC)) and climatic region. For PCC pavements, the categories of surface type were limited to JPC, JRC, and CRC because there were an insufficient number of PCC overlays (e.g., JPC/JPC) to perform a detailed and thorough analysis. Develop linear models for each pavement section (with multiple test data within a uniform construction event) for the specific smoothness indices. (e.g., for cell 1 in table 6, the model form IRI = alpha + beta*PI would be used). Develop database with all the beta's for each of the cells. Compute mean slope (mean values of beta) and other relevant statistics, such as standard deviation, for each cell. Figures 29 through 32 show, for both AC- and PCC-surfaced pavements, examples of the distribution of slopes for IRI versus PI0.0 and PI0.0 versus PI5-mm. Level 1 -- Checks for differences in mean slopes for cells within the two blocks. Level 2 -- Merging together statistically similar cells. Figure 28. Conceptual plot showing relationships of smoothness indices within and between cells. Figure 29. Histogram showing the distribution of slope for IRI versus PI0.0 (for cells in block 1, AC-surfaced pavements). Figure 30. Histogram showing the distribution of slope for IRI versus PI0.0 (for cells in block 2, PCC-surfaced pavements). Figure 31. Histogram showing the distribution of slope for PI0.0 versus PI5-mm (for cells in block 1, AC-surfaced pavements). Figure 32. Histogram showing the distribution of slope for PI0.0 versus PI5-mm (for cells in block 2, PCC-surfaced pavements). Determining classes and levels of the independent variables (pavement type and climate) used to define the cells to be analyzed. Developing ANOVA models for evaluating the effects of the independent variable beta) on the dependent variables. Performing test of hypotheses using the models and assembled data to determine whether there were significant differences in mean slopes for the cell under evaluation. Dependent variable -- Slope (beta) of IRI-PI and PI-PI relationships computed for each pavement type, test section, and for a uniform construction event. A uniform construction event implies that for the period for which the IRI-PI and PI-PI slopes are computed, no major maintenance or rehabilitation event occurred. Typically, data were available for 2 to 4 years. Each test section had approximately 22 data points consisting of repeated test runs and time-series data. Independent variables -- Climate (dry-freeze [DF], dry-nonfreeze [DNF], wet-freeze [WF], and wet-nonfreeze [WNF]) and pavement type (3 categories each for blocks 1 and 2 [block 1 -- AC, AC/AC, AC/PC; block 2 -- JPCP, JRCP, CRCP]). Beta = Slope of PI-IRI or PI-PI linear model. CLIMATE = Test pavement climate location. gamma(1), gamma(2), gamma(3) = Regression constants. Null hypothesis -- The mean slopes from cells A and B are not significantly different (HO: mu(A) = mu(B)). Alternative hypothesis -- The mean slopes from cells A and B are significantly different (HA: mu(A) does not equal mu(B)). Acceptance or rejection of the null hypothesis was accomplished by computing the level of significance (p-value) for each of the independent classification variables in equation 2 and comparing it to a pre-determined level of significance. For this study, a 95 percent level of significance (p-value = 5 percent) was used. Thus, a computed p-value of 0.05 or less would cause the null hypothesis to be rejected, whereas a p-value greater than 0.05 would confirm the null hypothesis. The results of the ANOVA are presented in tables 7 and 8 for AC and PCC pavements, respectively. The results show that both pavement type and climate had a significant effect on the PI-IRI and PI-PI relationships. That is, the ANOVA F-test results indicated that one or more of the mean slopes for the different cells in the matrix presented in table 6 were significantly different. Table 7. 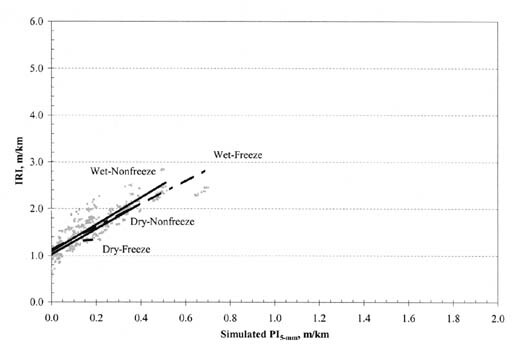 ANOVA results on the effect of pavement type and climate on PI-IRI relationship for AC pavements. a Computed for each wheelpath within a given pavement section within a uniform construction period. 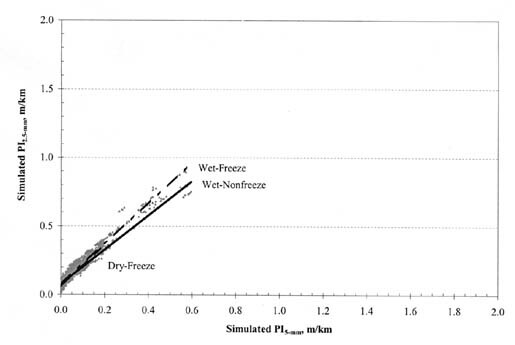 b Pavement type considered -- AC, AC/AC, and AC/PCC and climate types -- DF, DNF, WF, and WNF. c Borderline significance at the 10 percent significance level. d Significant at the 5 percent significance level. Table 8. 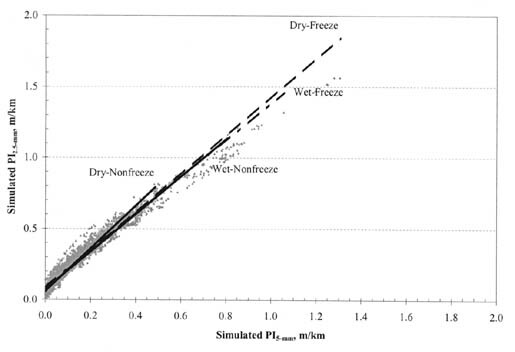 ANOVA results on the effect of pavement type and climate on PI-IRI relationship for PCC pavements. Although the ANOVA F-test results listed in tables 7 and 8 indicate significant differences in mean slope for the various cells evaluated, they do not show which cells were similar or how the cells differed from each other. This information is required in order to merge cells that have similar slopes or trends in their PI-IRI and PI-PI relationships, so as to optimize and reduce the number of models to be developed. Duncan's multiple comparison method in ANOVA was used to group cells with similarities among their mean slopes at a 95 percent significance level. Table 9 provides a summary of the grouping based on the Duncan's multiple comparison tests. The final groupings were based not only on the results of the statistical analysis, but also on the practicality of the groupings and engineering judgment. Linear regression models for all of the groupings (merged cells) in table 9 were developed and are presented in tables 10 through 13. Each model was verified for accuracy and reasonableness by evaluating diagnostic statistics, such as the standard estimate of the error (SEE), coefficient of determination (R2), and the number of data points used in model development. In general, the models appeared to be reasonable. For AC-surfaced pavement models, R2 was typically greater than 70 percent, with only 3 out of 33 models having reported R2 values less than 70 percent. SEE ranged from 178 to 308 mm/km (11.2 to 19.5 inches per mile) for IRI and 21 to 79 mm/km (1.3 to 5.0 inches per mile) for PI. These models contained the largest number of data points to date for modeling the PI-IRI relationships, ranging from 1,800 to 14,170 data points per model. Table 9. Summary of groupings (merged cells) used for model development. Note: Cells with the same numbers share the same model. Table 10. PI-to-IRI index conversion equations and variability indices for AC pavements. a Climatic zones: 1=DF, 2=DNF, 3=WF, 4=WNF. Table 11. PI-to-PI index conversion equations and variability indices for AC pavements. Table 12. PI-to-IRI index conversion equations and variability indices for PCC pavements. Table 13. 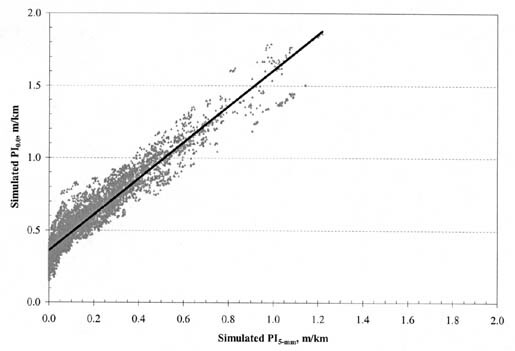 PI-to-PI index conversion equations and variability indices for PCC pavements. All of the PCC-surfaced pavement models had R2 greater than 70 percent. SEE ranged from 177 to 306 mm/km (11.2 to 19.4 inches per mile) for IRI and 21 to 79 mm/km (1.3 to 5.0 inches per mile) for PI. These models contain the largest number of data points to date for modeling the PI-IRI relationships, ranging from 1,366 to 12,039 data points per model. Fifteen models were developed for the PI-IRI relationships and 18 models were developed for the PI-PI relationships for AC-surfaced pavements. For PCC-surfaced pavements, 9 and 12 models were developed for PI-IRI and PI-PI relationships, respectively. The models were developed using a database that represented a reasonable inference space (IRI ranged from 300 to 4,000 mm/km [19 to 253 inches per mile] and PI ranged from 0 to 1,700 mm/km [0 to 108 inches per mile] for all blanking bands). The number of data points used in model development ranged from 1,300 to 14,000. In general, the models developed were adequate and predicted IRI and PI well. An evaluation of diagnostic statistics, such as SEE and R2, showed that there was a good correlation between the measured and predicted smoothness indices from the models (R2 was typically > 70 percent) with a reasonable level of error (ranged from 34 to 86.7 mm/km [2.1 to 5.5 inches per mile] for PI and 177 to 308 [11.2 to 19.5 inches per mile] for IRI). The models presented in tables 10 through 13 predict the mean smoothness index (IRI or PI) for the sample LTPP data used in model development. In this case, the sample means are probably a reasonable estimate of means of the population of pavements within the limits of the reference data. However, they do not necessarily indicate the range of values within which the true population means lies. mean = Predicted smoothness index. t = Value of t-statistic at a given significance level. alpha = Significance level (usually 90 or 95 percent). sigma = Model standard error of estimate (SEE). For example, if the predicted mean IRI (computed using models based on the LTPP data sample) is 1,000 mm/km (63.4 inches per mile), and the lower and upper limits at a significance level of 95 percent are 900 and 1,100 mm/km (57.0 and 69.7 inches per mile) respectively, then it can be concluded that there is a 95 percent probability that the population mean is between 900 and 1,100 mm/km (57.0 and 69.7 inches per mile). If the significance level is set to a smaller value (say 99 percent), then the interval would become wider thereby increasing the certainty of the estimate, and vice versa. In essence, the larger the sample size, the more reliable will be its mean, and the larger the variation (SEE), the less reliable will be the mean. Sample size used for development of both the LTPP PI-IRI and PI-PI models ranged from 1,347 to 14,170 data points. These numbers are greater than the generally required minimum of 100 and should provide reliable results. The SEE values associated with the PI-IRI models in tables 10 and 12 ranged from 179 to 292 mm/km (11.3 to 18 inches per mile). The SEE values associated with the PI-PI models in tables 11 and 13 ranged from 25 to 58 mm/km (1.6 to 3.7 inches per mile). These SEE values are reasonable, considering the inherent differences in the way surface wavelengths are processed for IRI and PI. The vast majority of U.S. highway agencies use smoothness specifications to ensure an adequate level of initial smoothness for newly constructed and resurfaced pavements. Smoothness specifications typically define the type of equipment and testing procedures to be used to measure initial smoothness, the method of identifying significant bumps to be removed, the type of smoothness statistics to be computed and reported, and the levels of smoothness required for full pay, bonuses, penalties, and corrective work. As discussed in chapter 1, most specifications are based on the PI smoothness statistic, as measured using a profilograph. Although these specifications differ primarily in terms of PI limits for acceptable smoothness and pay adjustment provisions, there are also differences in testing procedures and equipment. For instance, the length, location, and timeframe specified for testing may be different, as might the responsibility (i.e., contractor vs. agency) for testing. Also, there are various makes and models of profilographs (Ames, Cox, and McCracken California-type profilographs, Rainhart-type profilograph, and manual or computerized trace reduction), and different filters (3rd order Butterworth, 1st order Cox, and moving average), and blanking band sizes (0, 2.5, and 5 mm [0, 0.1, 0.2 inches]) that can be applied to compute PI. This chapter provides a summary of States' current AC and PCC smoothness specifications and presents the results of an effort to develop recommended IRI smoothness limits that correspond to existing specified PI limits. The recommended IRI limits were derived using the PI-IRI conversion models developed and reported in chapter 4. In the last 10 years, at least five different national surveys have been conducted to show the status of State smoothness specifications. In each of these surveys, about half of the responding agencies use a California- or Rainhart-type profilograph for testing new AC pavements, whereas slightly more than three-fourths of the agencies use profilographs for new PCC. Usage of response-type testing devices (e.g., Mays meter) on AC pavements declined slightly during this time, from about 15 percent in the mid 1990s to about 10 percent now. In contrast, the use of inertial profilers on AC pavements increased appreciably, from about 6 percent in the early 1990s to about 24 percent now. For testing of PCC pavements, the use of response-type systems stayed the same (about 2 percent), while the use of inertial profilers increased from about 6 percent in 1992 to about 10 percent now. Tables 14 and 15 list some of the key aspects of current State smoothness specifications, including the type of equipment and smoothness index used, the testing interval, and the smoothness ranges specified for acceptance, correction, bonus, and penalty. The information contained in these tables is based largely on data compiled by the FHWA in 2000 (Rizzo) and on inquiries made to selected State agencies. PI5-mm: 0 to 205 mm/km (0 to 13 inches per mile). PI2.5-mm: 150 to 505 mm/km (9.5 to 32 inches per mile). PI0.0: 161 to 536 mm/km (10.1 to 34 inches per mile). PI7.5-mm: 61 to 100 mm/km (3.9 to 6.3 inches per mile). PI2.5-mm: 0 to 250 mm/km (0 to 16 inches per mile). To assist agencies in transitioning from their existing PI-type specification to a PI0.0 or IRI specification, the LTPP-based correlation models developed and presented in chapter 4 were applied to the full-pay PI limits given in tables 14 and 15. For each State with a PI specification, the respective correlation model was used to develop best estimates of the full-pay PI0.0 and IRI limits for new AC, new PCC, AC overlays on AC, and AC overlays on PCC. The results of this effort are summarized in tables 16 through 19. Each table lists, for a given State, its currently reported PI5-mm, PI2.5-mm, or PI0.0 full-pay smoothness limits, its different climate types, and the estimated equivalent PI0.0 and IRI values, computed using the PI-IRI model reflective of the State's predominant climate (highlighted in column 3). These estimated equivalent PI0.0 and IRI values can be used as a starting point for developing specifications based on one of these two indices. Because the IRI and PI indices are not exactly correlated, tables 16 through 19 include a 90 percent standard error of the estimate range for the projected specification limit. This error rating should assist specification writers in defining their limits. It also can be used as a basis for refining the specification on an ongoing basis. Table 14. State agency smoothness specifications for asphalt pavements. a Limits are a direct English-Metric conversion from counterpart limits. Actual limits given by the Agency were not available. b Based on average profile index for entire project. c For PI between 476 mm/km (30.1 inches per mile) and 630 mm/km (40 inches per mile), must also grind to 475 mm/km (30 inches per mile) or below. d RQI: Ride quality index. Table 15. State agency smoothness specifications for concrete pavements. * Perf. Related Spec (PCC thickness, strength, smoothness) >80 mm/km (>5.0 inches per mile). e For PI greater than 100 mm/km (6.3 inches per mile), must also grind to 100 mm/km (6.3 inches per mile) or less. f For PI greater than 700 mm/km (44.3 inches per mile), must also grind to 700 mm/km (44.3 inches per mile) or less. Table 16. 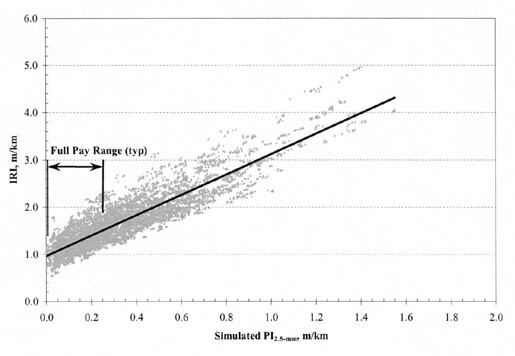 Estimated equivalent PI0.0 and IRI values for PI-based smoothness specifications for new AC pavement. a SEE = Standard error of the estimate. Range of values with 90 percent confidence. b Extrapolated from actual specification, which calls for PI </= 8 mm per 0.1 km. c Extrapolated from actual specification, which calls for PI </= 30 mm per 0.16 km. Table 17. Estimated equivalent PI0.0 and IRI values for PI-based smoothness specifications for AC overlays on AC pavement. Table 18. Estimated equivalent PI0.0 and IRI values for PI-based smoothness specifications for AC overlays on PCC pavement. Table 19. Estimated equivalent PI0.0 and IRI values for PI-based smoothness specifications for new PCC pavement and PCC overlays. a SEE = Standard error of the estimate. Range of values with 90 percent confidence. b Extrapolated from actual specification, which calls for PI </= 8 mm per 0.1 km. c Extrapolated from actual specification, which calls for 23 </= PI </= 25 mm per 0.16 km. d Extrapolated from actual specification, which calls for 8 </= PI </= 13 mm per 0.16 km. e Actual specification calls for incentives for PI</=568 mm/km (36 inches per mile) and correction for PI>568 inches per mile (36 inches per mile). For example, if Maryland (a wet-freeze climatic zone state) entertained thoughts of switching from PI5-mm to PI0.0, it could refer to table 16 to identify the comparable PI0.0 range for the current PI5-mm full-pay range 64 to 110 mm/km (4 to 7 inches per mile). This range is estimated to be 321 to 403 mm/km (20.3 to 25.5 inches per mile). With a standard error of the estimate (SEE) of 72 mm/km (4.6 inches per mile) for this relationship, the specification writer can assume that variability within the relationship results in a reasonable range for comparable PI0.0 values of 321 to 403 mm/km (20.3 to 25.5 inches per mile). 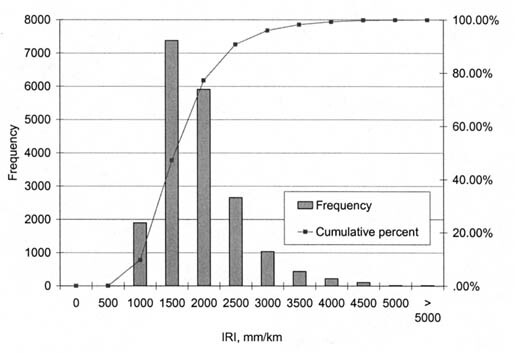 If, on the other hand, the agency desired to transition to an IRI specification, it could use the comparable IRI range of 1,096 to 1,254 mm/km [70 to 79.5 inches per mile]). The SEE for this relationship is 266 mm/km (16.9 inches per mile). Direct State-to-State comparisons of derived specification limits may not be appropriate due to individual agencies' implementation practices. Factors that may affect the specification limits for a specific agency include segment length, whether an agency aggregates segments, scope of application (new pavements or overlays, and type facilities), and method of index computation (half-car roughness index, individual wheelpath IRI, or average IRI). 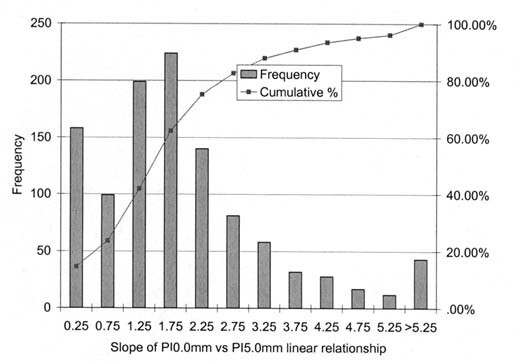 In the search for reasonable, practical relationships that link IRI with PI5-mm, PI2.5-mm, and PI0.0, and PI0.0 with PI5-mm and PI2.5-mm, a comprehensive evaluation was made of trends documented in past pavement smoothness studies, as well as trends developed in this study from vast amounts of LTPP profile and smoothness data. The background and results of these studies were presented and discussed in previous chapters of this report. Although past documented PI-IRI relationships were rather limited (particularly with respect to PI2.5-mm-IRI relationships) and showed varying degrees of disparity, factors such as pavement type, equipment characteristics, and filtering methods contributed significantly to these disparities. A much broader and more controlled evaluation using over 43,000 LTPP smoothness data points showed generally similar PI-IRI trends as the past study trends. 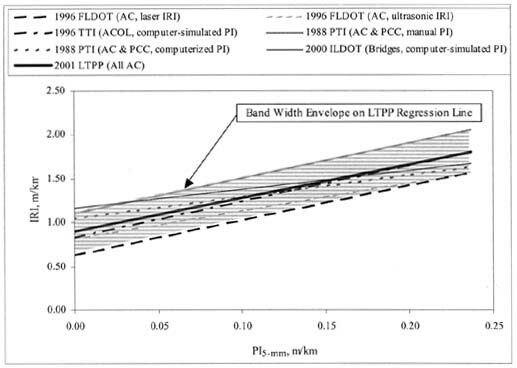 The data points consisted of IRI and simulated PI values computed from the same longitudinal profiles measured multiple times for 1,793 LTPP pavement test sections. Detailed statistical analyses of IRI and simulated PI data indicated a reasonable correlation between IRI and PI (PI5-mm, PI2.5-mm, and PI0.0) and between PI0.0 and PI (PI5-mm and PI2.5-mm). However, it was determined that pavement type (i.e., AC, JPC, AC/PCC) and climatic conditions (i.e., dry-freeze, wet-nonfreeze) are significant factors in the relationship between IRI and PI. The effects of these variables were taken into consideration in the development of PI-to-IRI and PI-to-PI conversion models. A total of 15 PI-to-IRI models and 18 PI-to-PI models covering all three PI blanking band sizes (5, 2.5, and 0 mm [0.2, 0.1, and 0 in]) and all four climatic zones (dry-freeze, dry-nonfreeze, wet-freeze, and wet-nonfreeze) were developed for AC-surfaced pavements. Similarly, for PCC-surfaced pavements, 9 PI-to-IRI models and 12 PI-to-PI models were developed. The equations, estimated standard errors, and other relevant statistics for all 54 models are summarized in tables 10 through 13 in chapter 4. These equations can be used to assist highway agency personnel in transitioning smoothness specification limits from PI to IRI or to PI with a tighter blanking band. Chapter 5 of this report illustrated the results of applying these conversion equations to existing State smoothness specifications. Each State's PI5-mm, PI2.5-mm, or PI0.0 full-pay range was converted to an estimated equivalent IRI range, and each State's PI5-mm or PI2.5-mm full-pay range was converted to an estimated equivalent PI0.0. Results of this exercise are summarized in tables 16 through 19 in chapter 5. Evaluate the validity of the research results based on agency conditions and experiences. Use the correlation equations and variability information to estimate the required level of smoothness for a specification that transitions to IRI or to PI with a tighter blanking band. It is recommended that the derived specification limits be adjusted to reflect agency implementation practices such as segment length, segment averaging, scope of application, and index computation method. Track the results of the new smoothness specification and adjust the smoothness requirements to meet the increasing abilities of contractors and the smoothness levels desired by the agency. Baus, R., and W. Hong. 1999. "Investigation and Evaluation of Roadway Rideability Equipment and Specifications," Federal Highway Administration/South Carolina Department of Transportation Report FHWA-SC-99-05, Columbia, South Carolina. Fernando, E.G. 2000. "Evaluation of Relationship Between Profilograph and Profile-Based Roughness Indices," Paper Prepared for the 79th Annual Meeting of the Transportation Research Board, Washington, D.C.
Florida Department of Transportation (FLDOT). 1997. "Comparison of Ride Quality Monitoring Equipment Used for New Construction," Draft Report, Pavement Systems Evaluation Study 97-2, Florida Department of Transportation State Materials Office, Tallahassee, Florida. Hossain, M., M. Akhter, J. Hancock, and J. Boyer. 2000. "Evaluation of Performance of Lightweight Profilometers," Final Report prepared for Kansas Department of Transportation, Kansas State University, Manhatten, Kansas. Kombe, E.M. and S.A. Kalevela. 1993. "Evaluation of Initial Pavement Smoothness for the Development of PCCP Construction Specifications," Phase I Final Report, Arizona Department of Transportation, Phoenix, Arizona. Ksaibati , K., R. McNamera, W. Miley, and J. Armaghani. 1999. "Pavement Roughness Data Collection and Utilization," Transportation Research Record 1655, Transportation Research Board, Washington, D.C.
Kulakowski, B.T. and J.C. Wambold. 1989. "Development of Procedures for the Calibration of Profilographs." Final Report, Pennsylvania Transportation Institute (PTI), Pennsylvania State University, University Park, Pennsylvania. Rizzo, R. 2000 "Survey of State Smoothness Specifications," Federal Highway Administration, Michigan Division, Lansing, Michigan. Rufino, D., K. Baraka, and M.I. Darter. 2000. "Development of a Bridge Smoothness Specification for Illinois DOT," Interim Report prepared for Illinois Department of Transportation, Report No. FHWA-IL-UI-279, University of Illinois, Urbana-Champaign, Illinois. Scofield, L. 1993. "Profilograph Limitations, Correlations, and Calibration Criteria for Effective Performance-Based Specifications," NCHRP Project 20-7 Task 53 Draft Report, Transportation Research Board, Washington, D.C. Figure A-1. IRI vs. PI0.0 for all AC pavement types and climatic zones. Figure A-2. IRI vs. PI2.5-millimeter for all AC pavement types and climatic zones. Figure A-3. IRI vs. PI5-millimeter for all AC pavement types and climatic zones. Figure A-4. IRI vs. PI0.0, PI2.5-millimeter, and PI5-millimeter for all AC pavement types and climatic zones. Figure A-5. IRI vs. PI0.0 by AC pavement type for all climatic zones. Figure A-6. IRI vs. PI2.5-millimeter by AC pavement type for all climatic zones. Figure A-7. IRI vs. PI5-millimeter by AC pavement type for all climatic zones. Figure A-8. 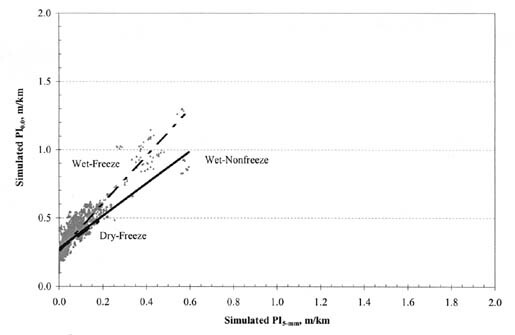 IRI vs. PI0.0 by climatic zone for AC pavements. Figure A-9. IRI vs. PI2.5-millimeter by climatic zone for AC pavements. Figure A-10. IRI vs. PI5-millimeter by climatic zone for AC pavements. Figure A-11. IRI vs. PI0.0 by climatic zone for AC/AC pavements. Figure A-12. IRI vs. PI2.5-millimeter by climatic zone for AC/AC pavements. Figure A-13. IRI vs. PI5-millimeter by climatic zone for AC/AC pavements. Figure A-14. 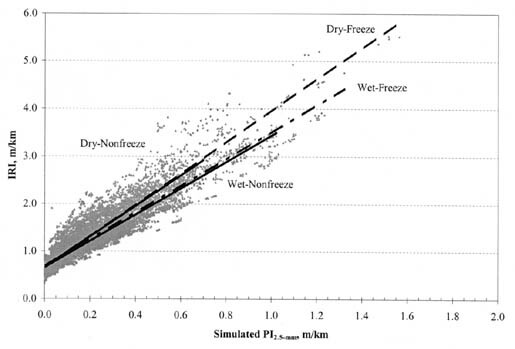 IRI vs. PI0.0 by climatic zone for AC/PCC pavements. Figure A-15. IRI vs. PI2.5-millimeter by climatic zone for AC/PCC pavements. Figure A-16. IRI vs. PI5-millimeter by climatic zone for AC/PCC pavements. Figure A-17. 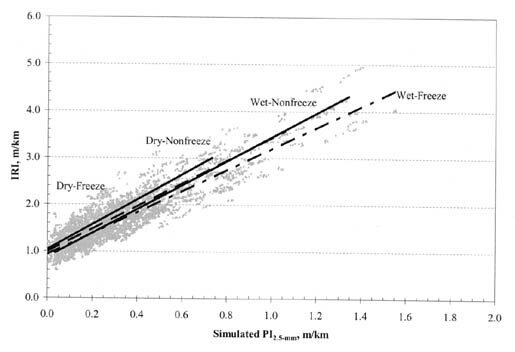 IRI vs. PI0.0 by climatic zone for all AC pavement types. Figure A-18. IRI vs. PI2.5-millimeter by climatic zone for all AC pavement types. Figure A-19. IRI vs. PI5-millimeter by climatic zone for all AC pavement types. Figure A-20. 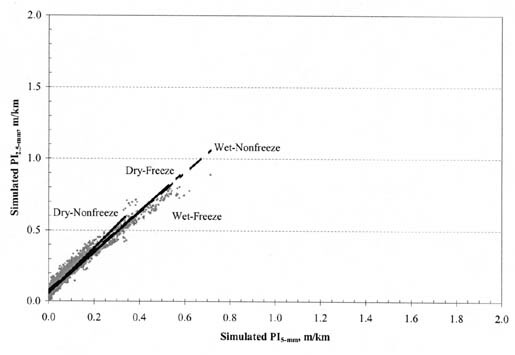 PI0.0 vs. PI5-millimeter for all AC pavement types and climatic zones. Figure A-21. PI0.0 vs. PI2.5-millimeter for all AC pavement types and climatic zones. Figure A-22. PI2.5-millimeter vs. PI5-millimeter for all AC pavement types and climatic zones. Figure A-23. PI0.0 vs. PI5-millimeter by AC pavement type for all climatic zones. Figure A-24. PI0.0 vs. PI2.5-millimeter by AC pavement type for all climatic zones. Figure A-25. PI2.5-millimeter vs. PI5-millimeter by AC pavement type for all climatic zones. Figure A-26. 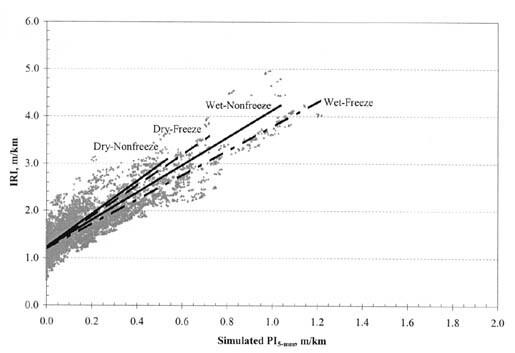 PI0.0 vs. PI5-millimeter by climatic zone for all AC pavement types. Figure A-27. 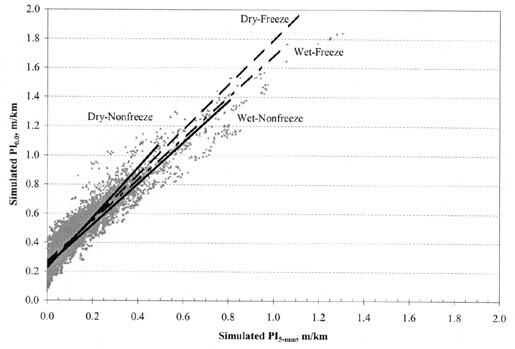 PI0.0 vs. PI2.5-millimeter by climatic zone for all AC pavement types. Figure A-28. PI2.5-millimeter vs. PI5-millimeter by climatic zone for all AC pavement types. Figure A-29. 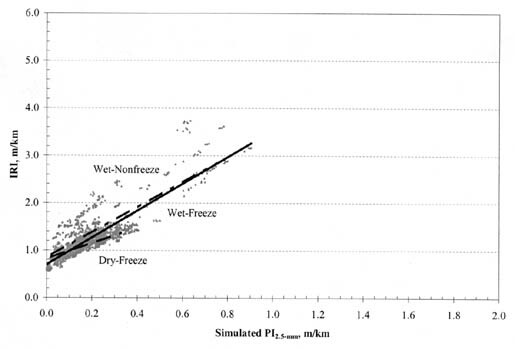 PI0.0 vs. PI5-millimeter by climatic zone for AC pavements. Figure A-30. 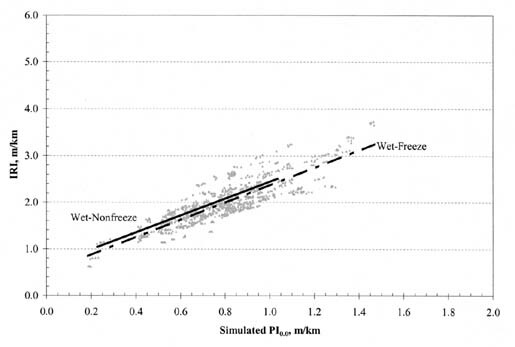 PI0.0 vs. PI2.5-millimeter by climatic zone for AC pavements. Figure A-31. 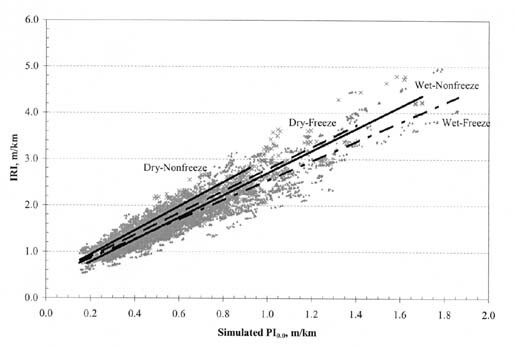 PI2.5-millimeter vs. PI5-millimeter by climatic zone for AC pavements. Figure A-32. 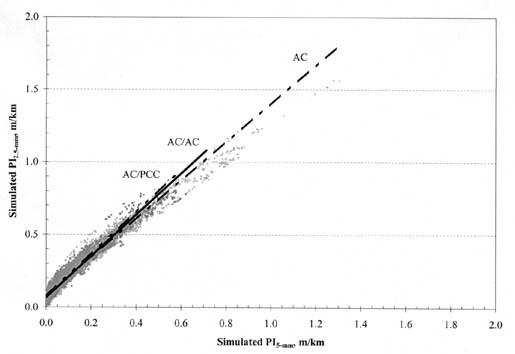 PI0.0 vs. PI5-millimeter by climatic zone for AC/AC pavements. Figure A-33. 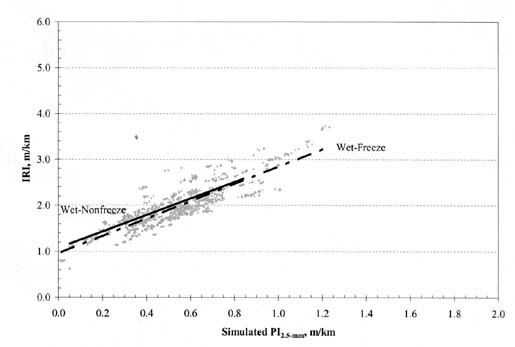 PI0.0 vs. PI2.5-millimeter by climatic zone for AC/AC pavements. Figure A-34. PI2.5-millimeter vs. PI5-millimeter by climatic zone for AC/AC pavements. Figure A-35. 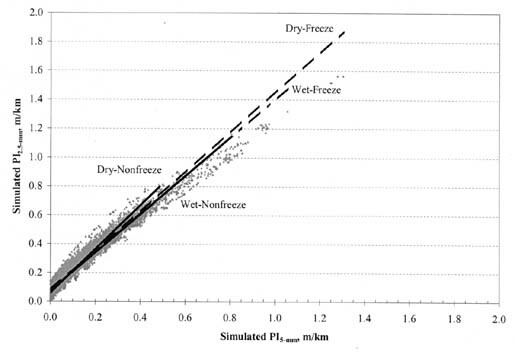 PI0.0 vs. PI5-millimeter by climatic zone for AC/PCC pavements. Figure A-36. PI0.0 vs. PI2.5-millimeter by climatic zone for AC/PCC pavements. Figure A-37. PI2.5-millimeter vs. PI5-millimeter by climatic zone for AC/PCC pavements. Figure B-1. IRI vs. PI0.0 for all PCC pavement types and climatic zones. Figure B-2. IRI vs. PI2.5-millimeter for all PCC pavement types and climatic zones. Figure B-3. IRI vs. PI5-millimeter for all PCC pavement types and climatic zones. Figure B-4. IRI vs. PI0.0, PI2.5-millimeter, and PI5-millimeter for all PCC pavement types and climatic zones. Figure B-5. IRI vs. PI0.0 by PCC pavement type for all climatic zones. Figure B-6. IRI vs. PI2.5-millimeter by PCC pavement type for all climatic zones. Figure B-7. IRI vs. PI5-millimeter by PCC pavement type for all climatic zones. Figure B-8. 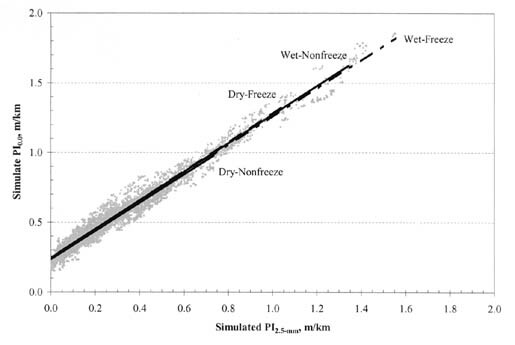 IRI vs. PI0.0 by climatic zone for CRC pavements. Figure B-9. IRI vs. PI2.5-millimeter by climatic zone for CRC pavements. Figure B-10. IRI vs. PI5-millimeter by climatic zone for CRC pavements. Figure B-11. 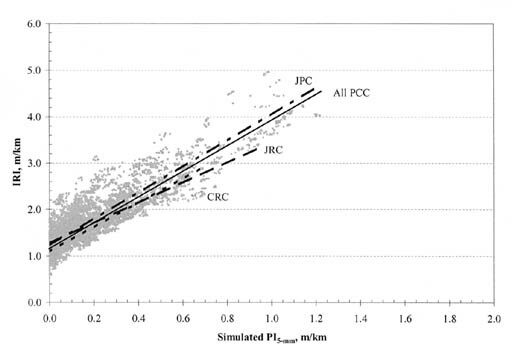 IRI vs. PI0.0 by climatic zone for JPC pavements. Figure B-12. IRI vs. PI2.5-millimeter by climatic zone for JPC pavements. Figure B-13. 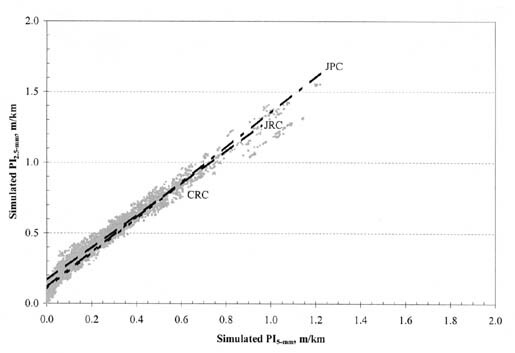 IRI vs. PI5-millimeter by climatic zone for JPC pavements. Figure B-14. 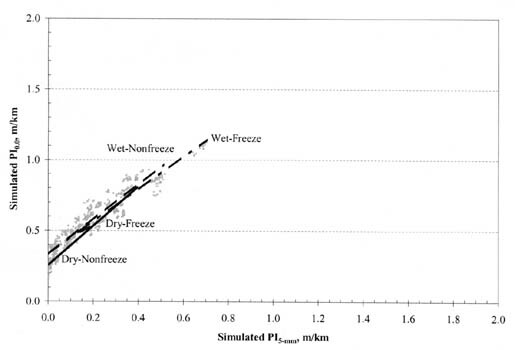 IRI vs. PI0.0 by climatic zone for JRC pavements. Figure B-15. 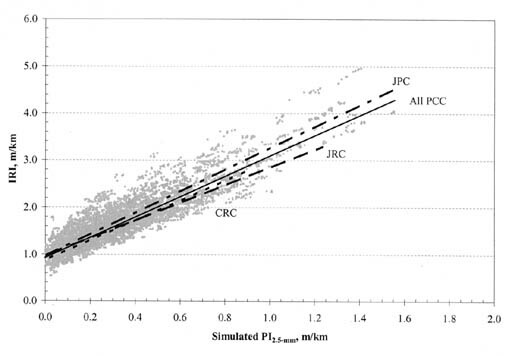 IRI vs. PI2.5-millimeter by climatic zone for JRC pavements. Figure B-16. 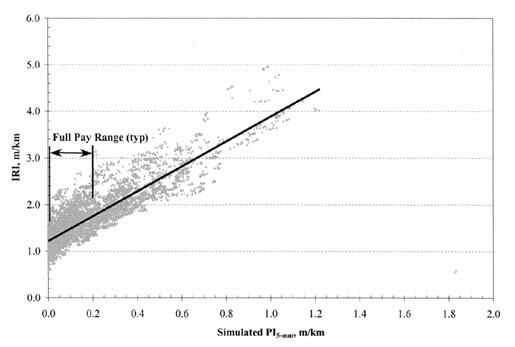 IRI vs. PI5-millimeter by climatic zone for JRC pavements. Figure B-17. IRI vs. PI0.0 by climatic zone for all PCC pavement types. Figure B-18. IRI vs. PI2.5-millimeter by climatic zone for all PCC pavement types. Figure B-19. IRI vs. PI5-millimeter by climatic zone for all PCC pavement types. Figure B-20. 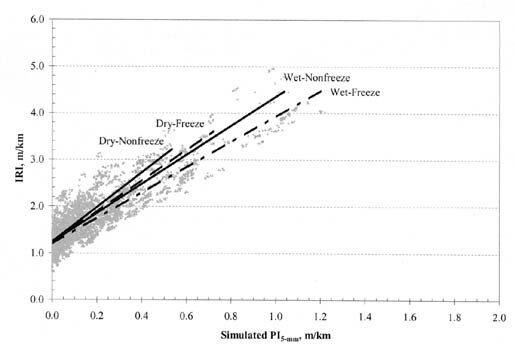 PI0.0 vs. PI5-millimeter for all PCC pavement types and climatic zones. Figure B-21. 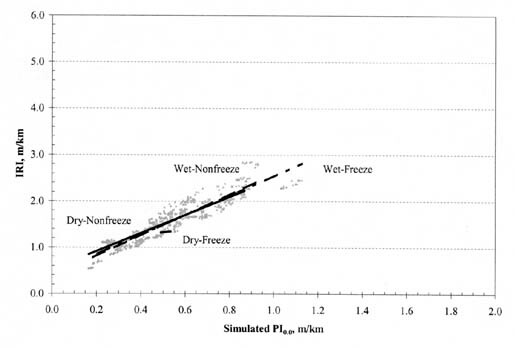 PI0.0 vs. PI2.5-millimeter for all PCC pavement types and climatic zones. Figure B-22. PI2.5-millimeter vs. PI5-millimeter for all PCC pavement types and climatic zones. Figure B-23. PI0.0 vs. PI5-millimeter by PCC pavement type for all climatic zones. Figure B-24. PI0.0 vs. PI2.5-millimeter by PCC pavement type for all climatic zones. Figure B-25. PI2.5-millimeter vs. PI5-millimeter by PCC pavement type for all climatic zones. Figure B-26. 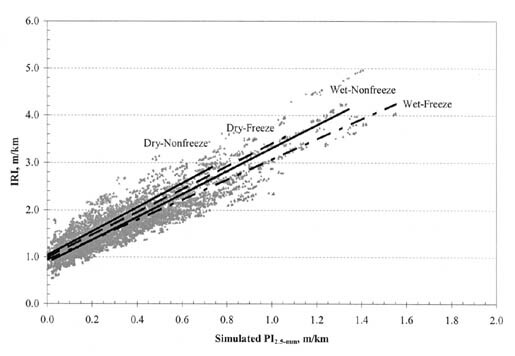 PI0.0 vs. PI5-millimeter by climatic zone for all PCC pavement types. Figure B-27. PI0.0 vs. PI2.5-millimeter by climatic zone for all PCC pavement types. Figure B-28. 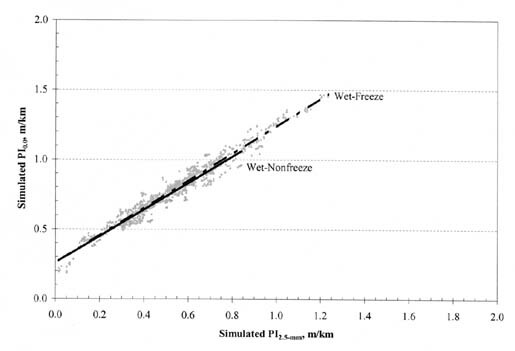 PI2.5-millimeter vs. PI5-millimeter by climatic zone for all PCC pavement types. Figure B-29. PI0.0 vs. PI5-millimeter by climatic zone for CRC pavements. Figure B-30. 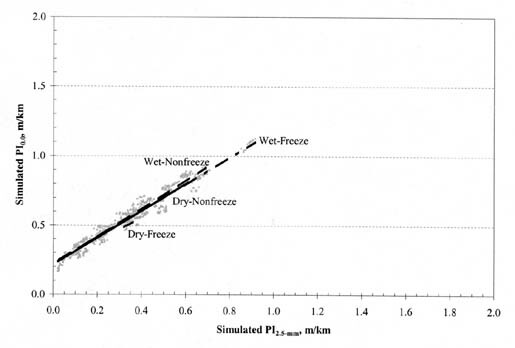 PI0.0 vs. PI2.5-millimeter by climatic zone for CRC pavements. Figure B-31. PI2.5-millimeter vs. PI5-millimeter by climatic zone for CRC pavements. Figure B-32. 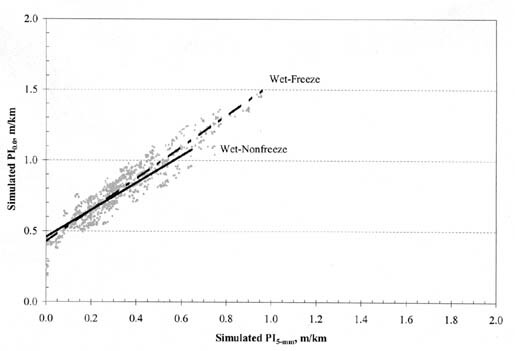 PI0.0 vs. PI5-millimeter by climatic zone for JPC pavements. Figure B-33. 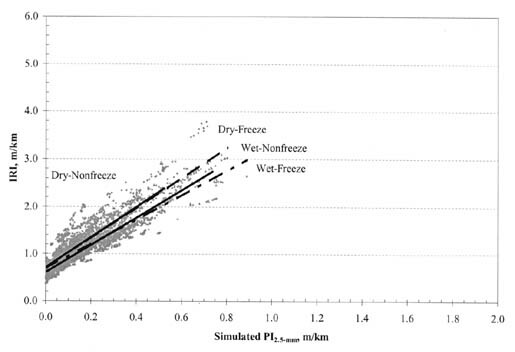 PI0.0 vs. PI2.5-millimeter by climatic zone for JPC pavements. Figure B-34. 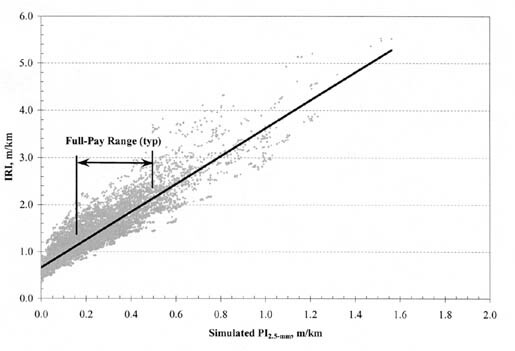 PI2.5-millimeter vs. PI5-millimeter by climatic zone for JPC pavements. Figure B-35. 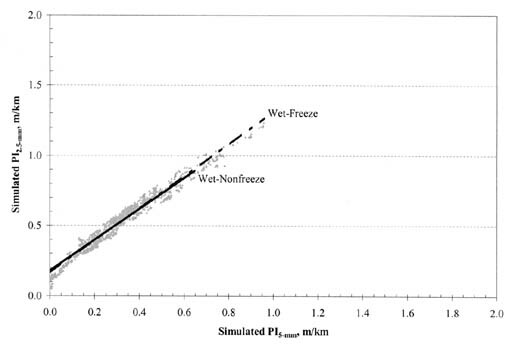 PI0.0 vs. PI5-millimeter by climatic zone for JRC pavements. Figure B-36. 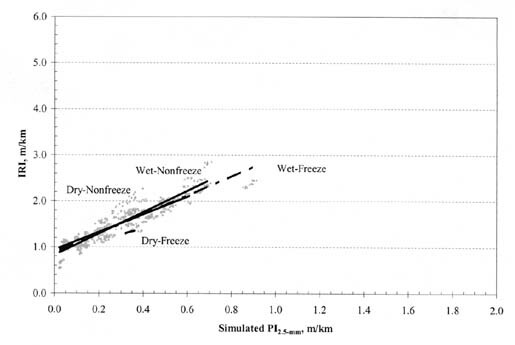 PI0.0 vs. PI2.5-millimeter by climatic zone for JRC pavements. Figure B-37. PI2.5-millimeter vs. PI5-millimeter by climatic zone for JRC pavements.